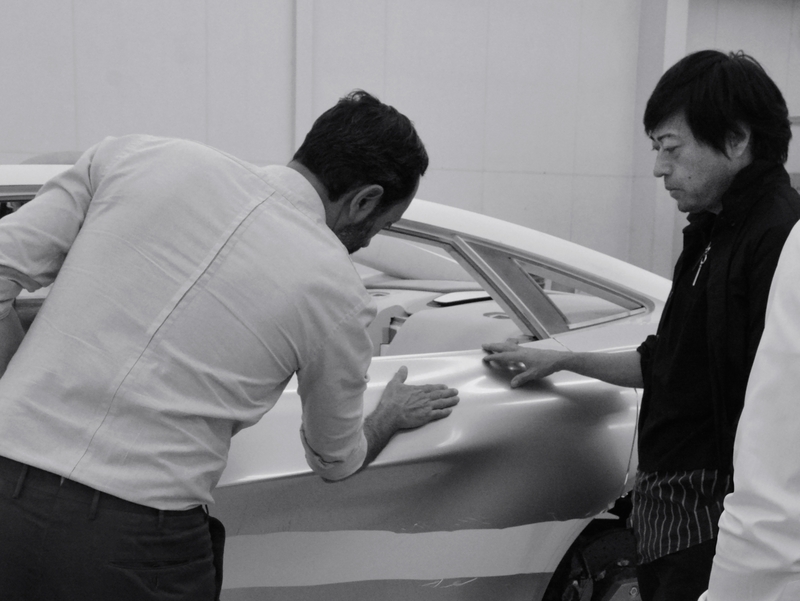 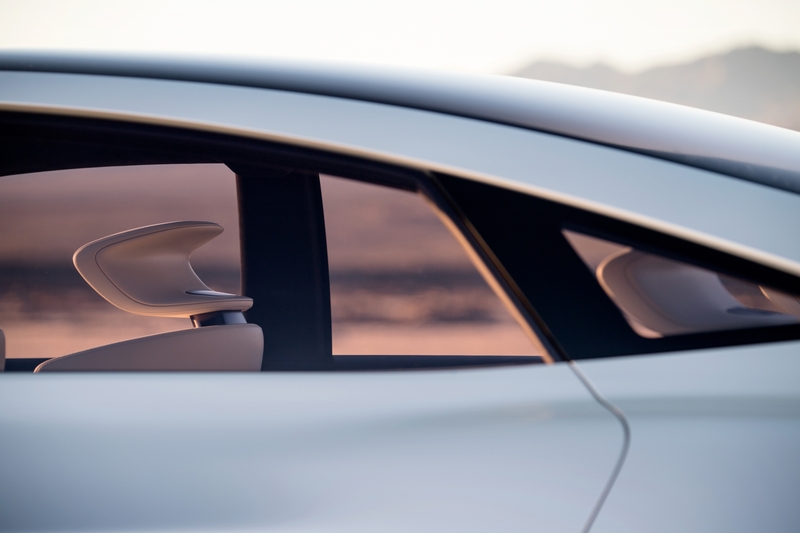 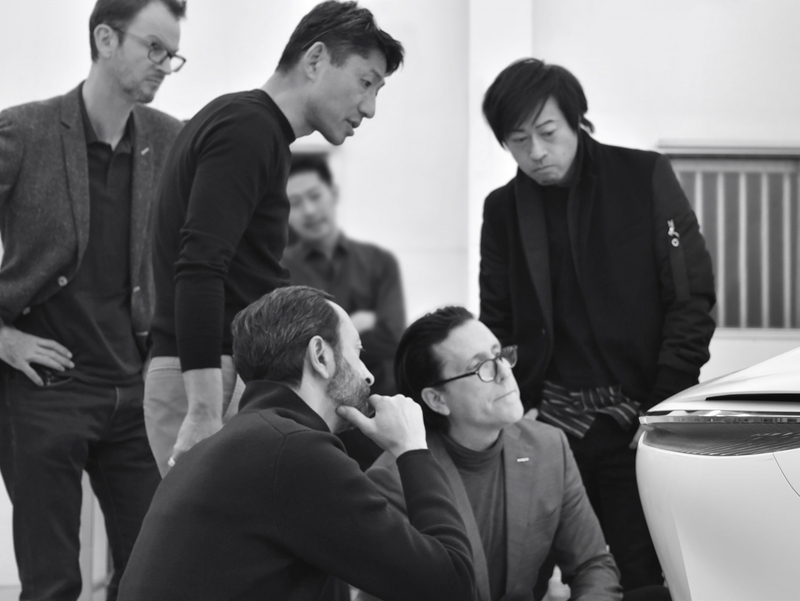 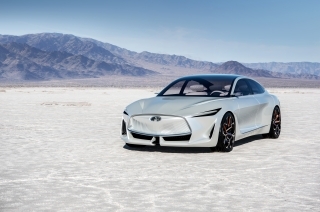 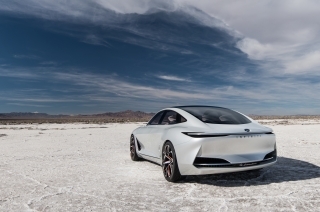 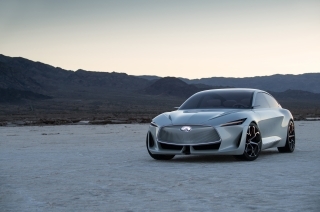 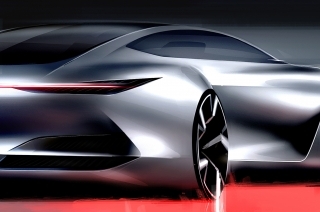 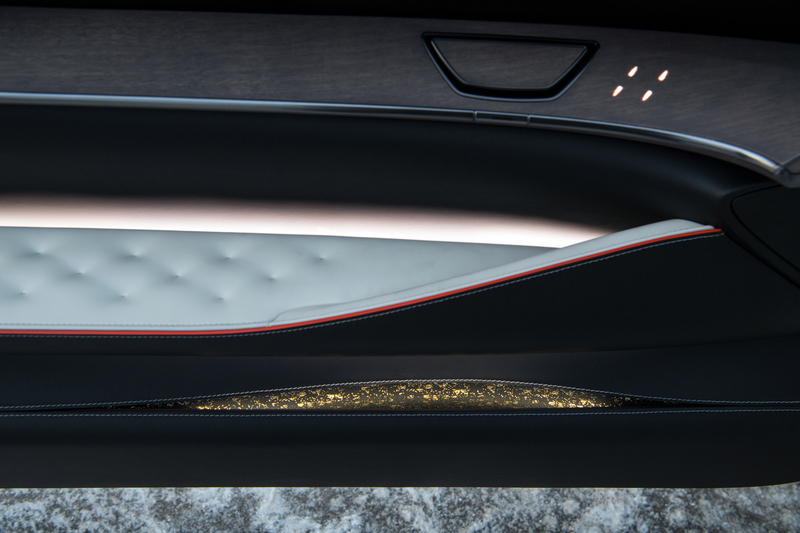 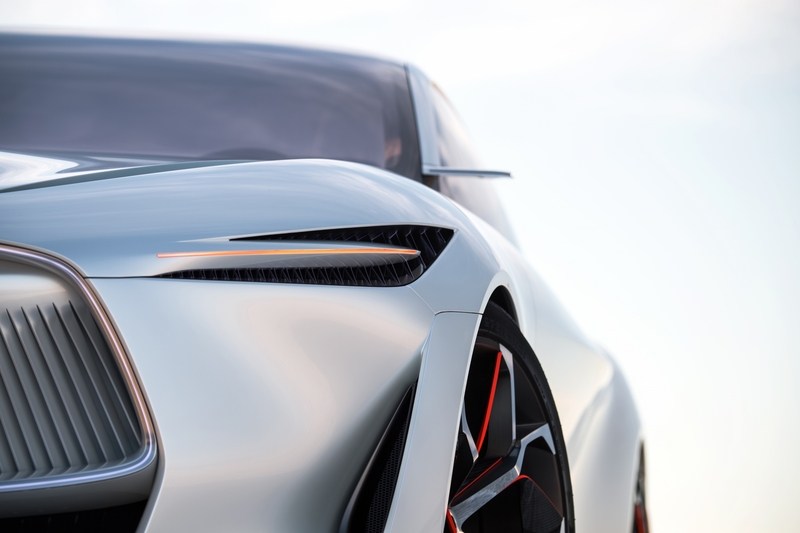 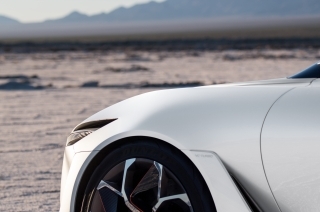 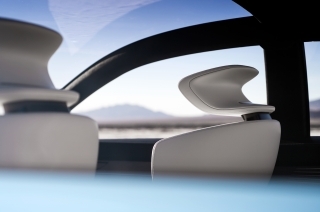 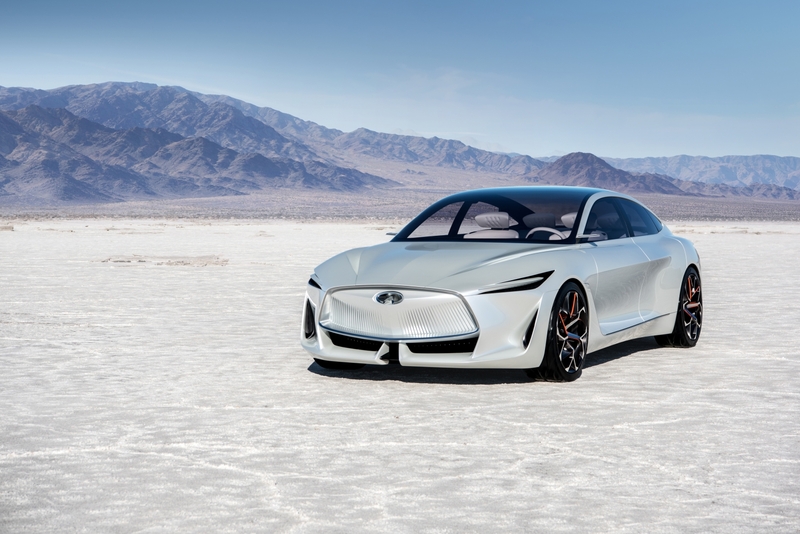 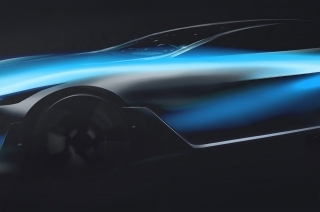 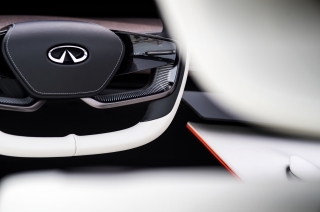 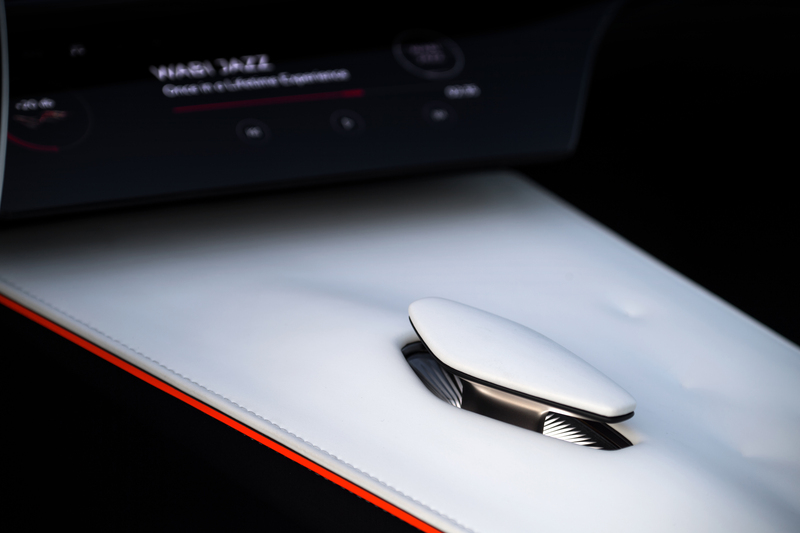 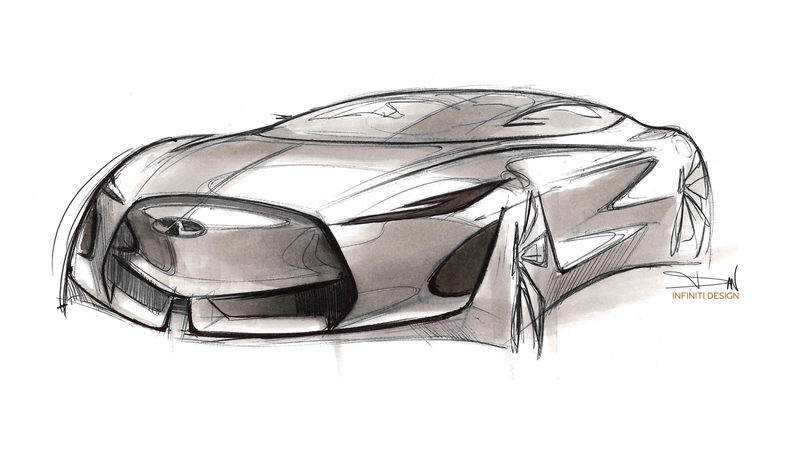 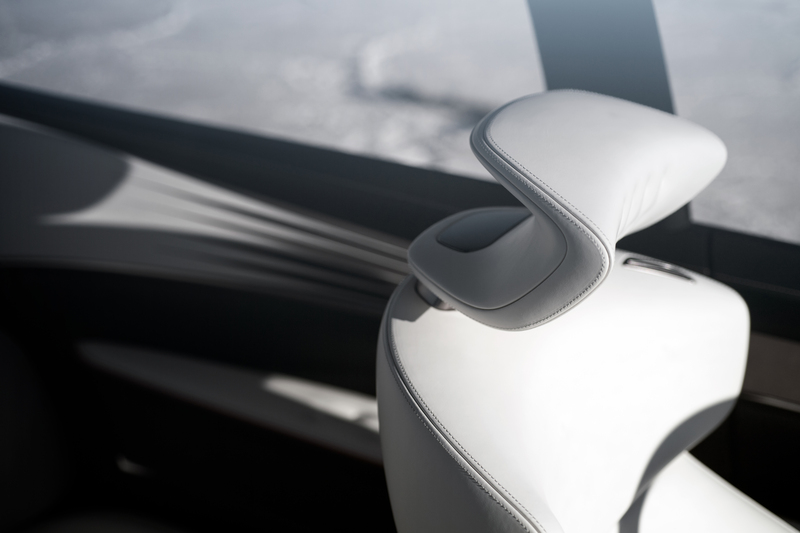 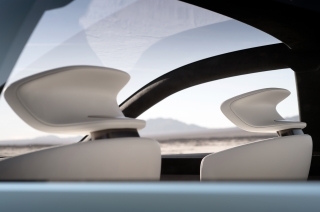 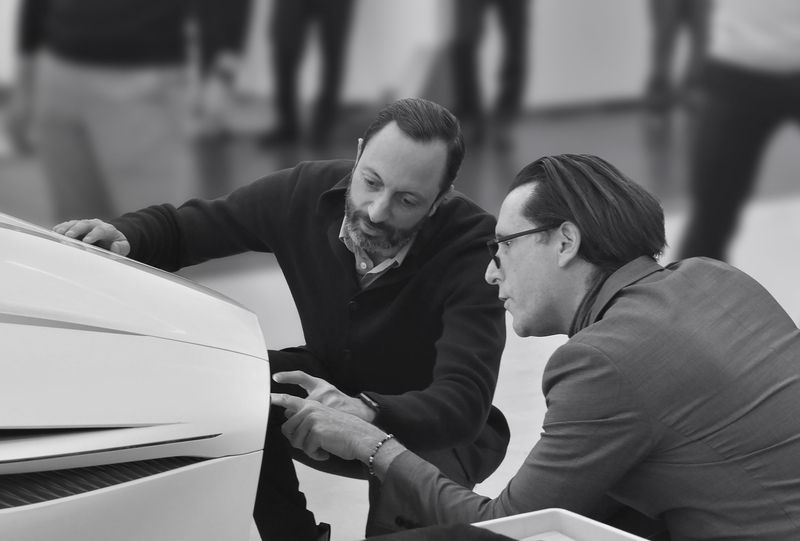 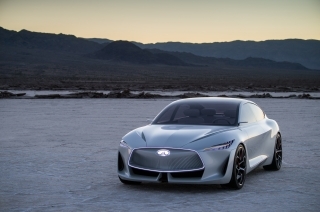 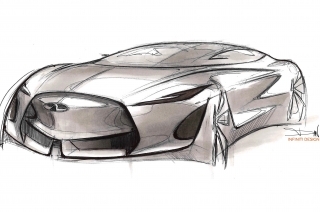 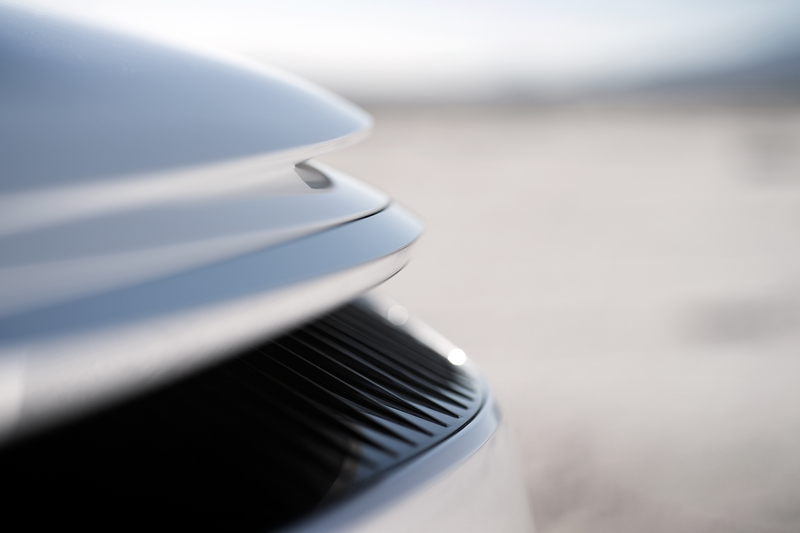 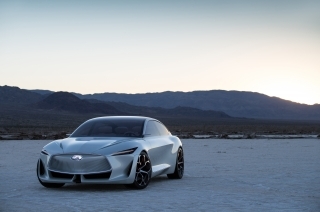 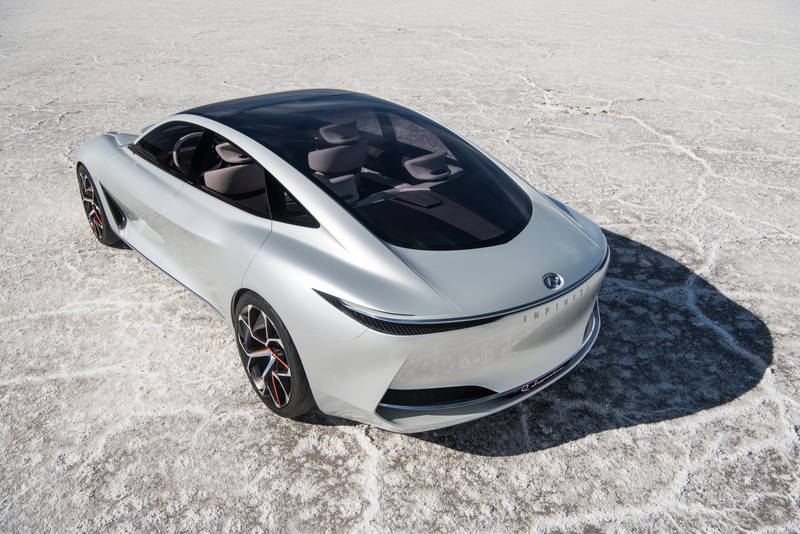 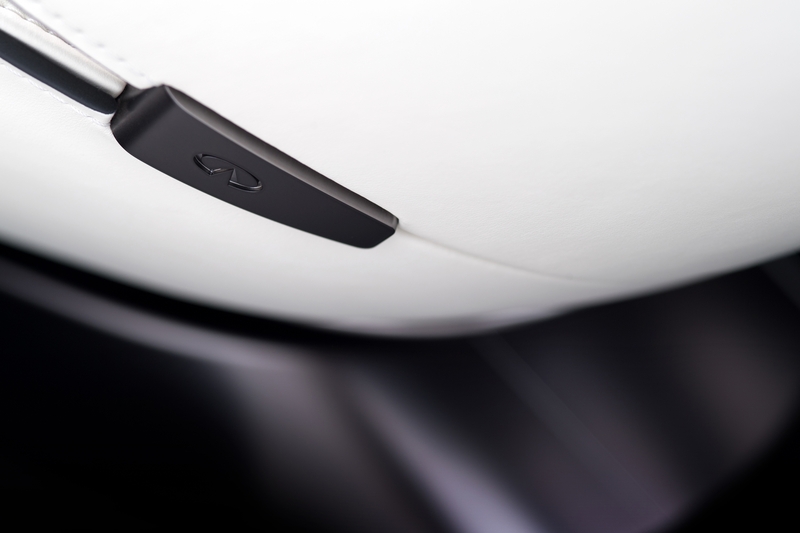 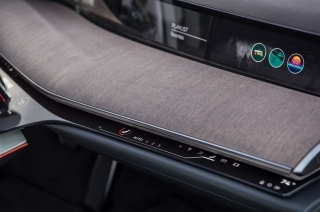 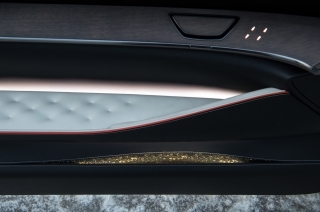 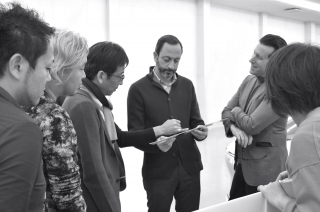 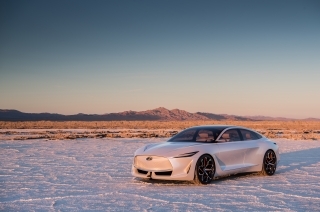 Hong Kong/Detroit – Previewing a new generation of INFINITI vehicles, the Q Inspiration Concept proposes how an innovative VC-Turbo powertrain, next-level autonomous drive technologies, and a unique human-centric interior could enrich the experience for drivers of premium sedans. 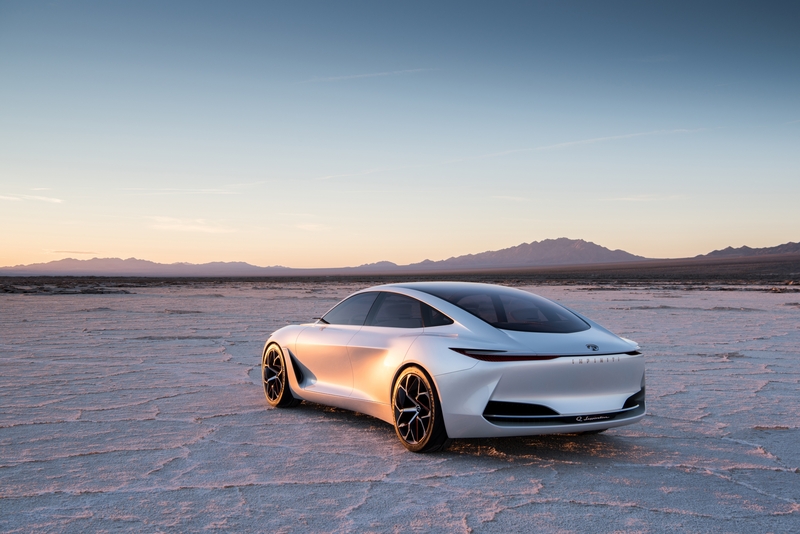 The car has been revealed today for the first time at the 2018 North American International Auto Show. 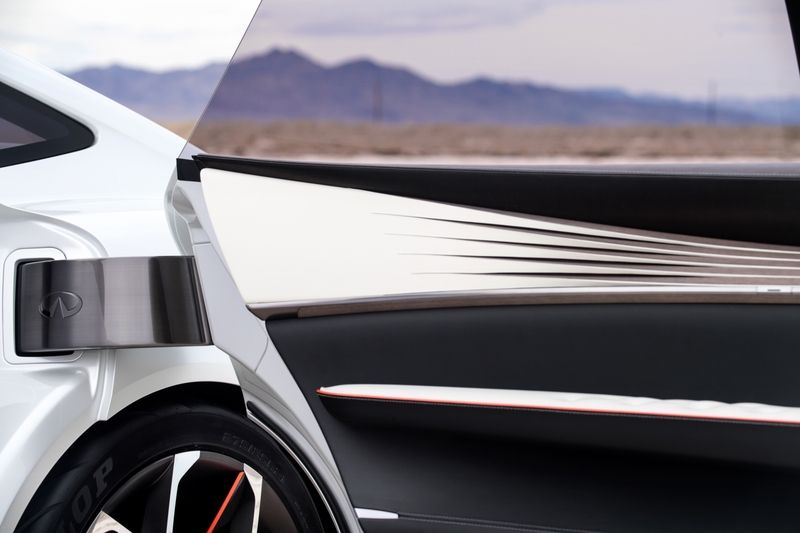 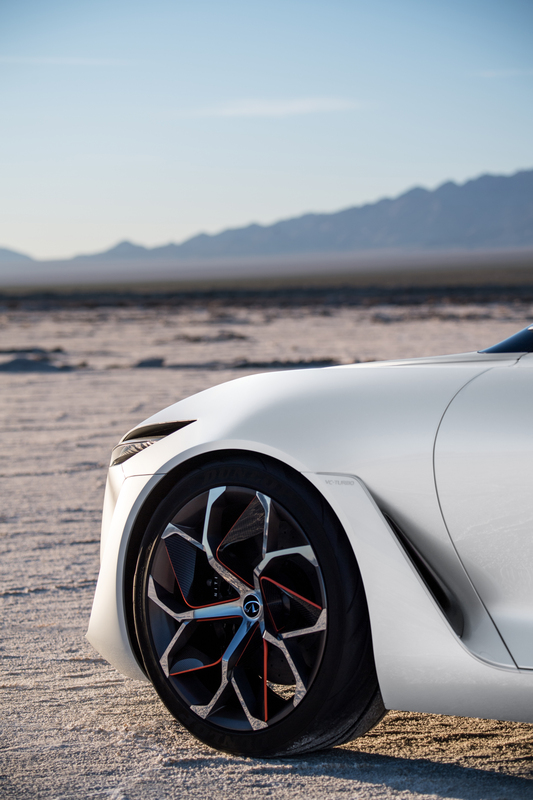 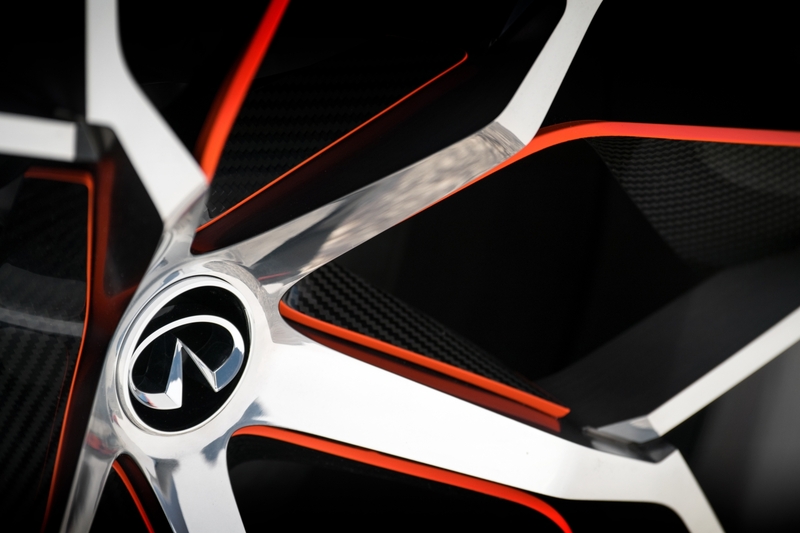 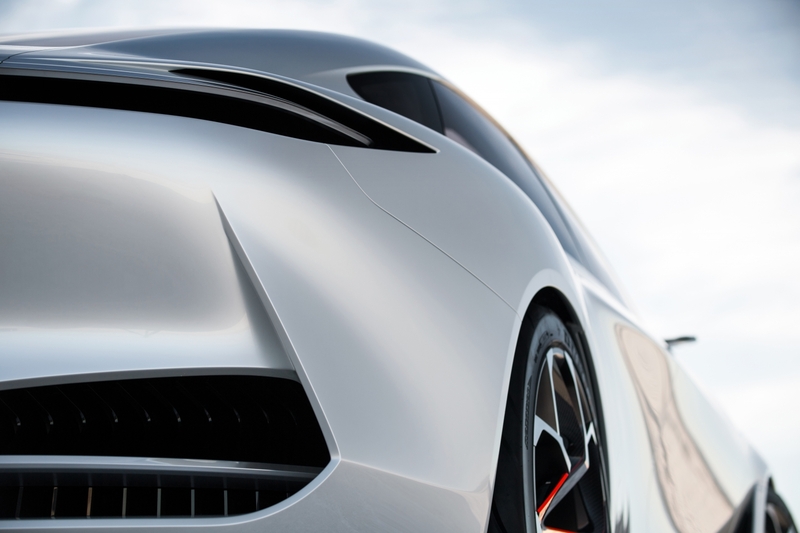 Presenting the next stride in INFINITI design, the exterior of the Q Inspiration Concept features a concise design with dynamic and confident proportions. 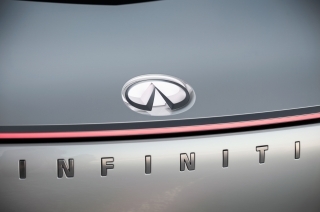 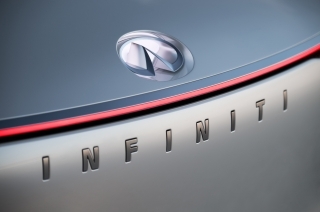 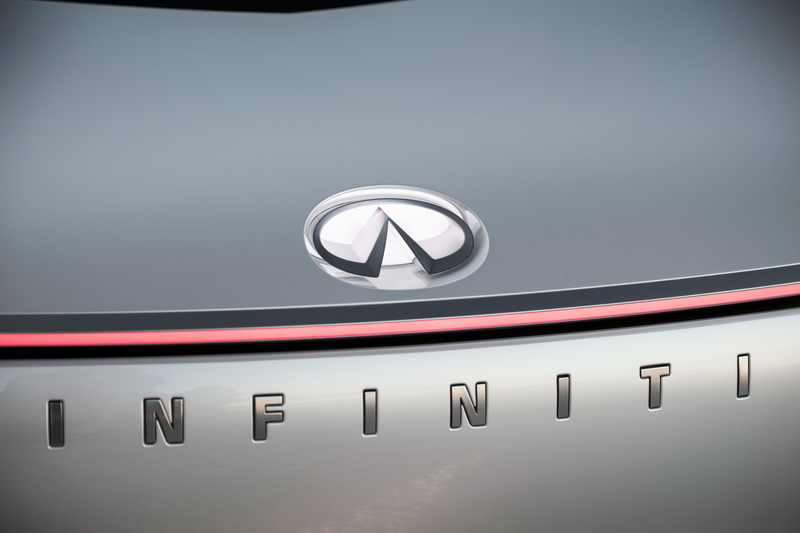 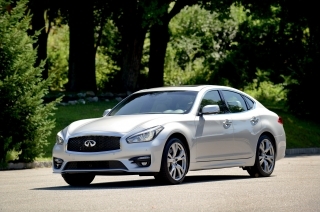 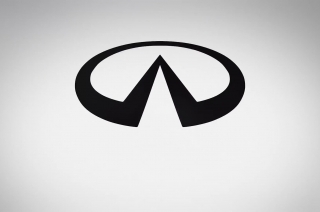 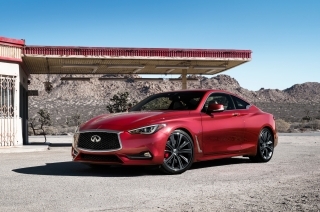 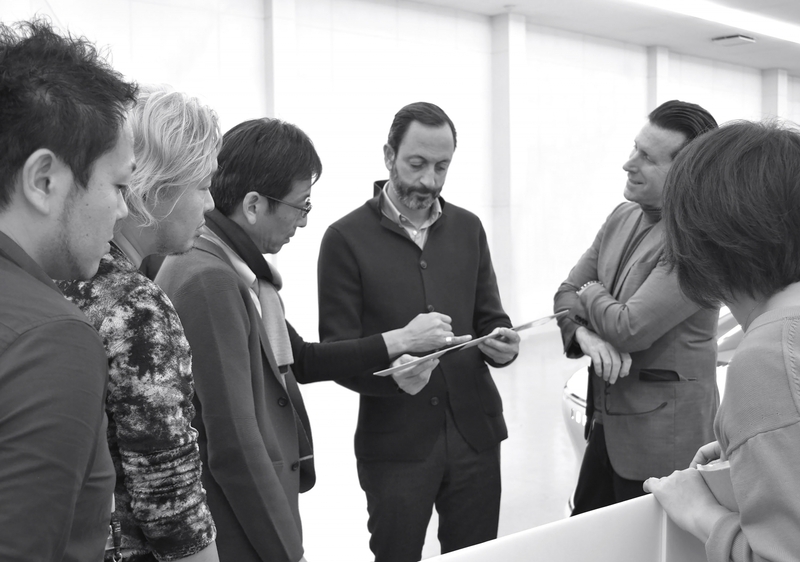 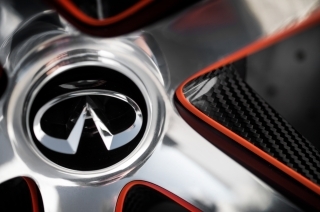 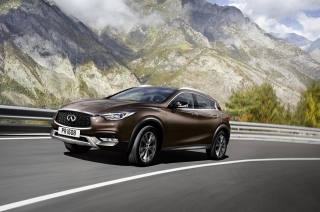 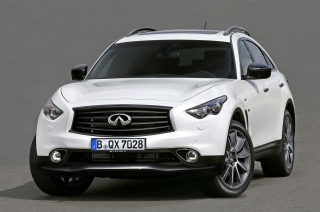 It is the first manifestation of INFINITI’s new form language, for an era of advanced powertrains. 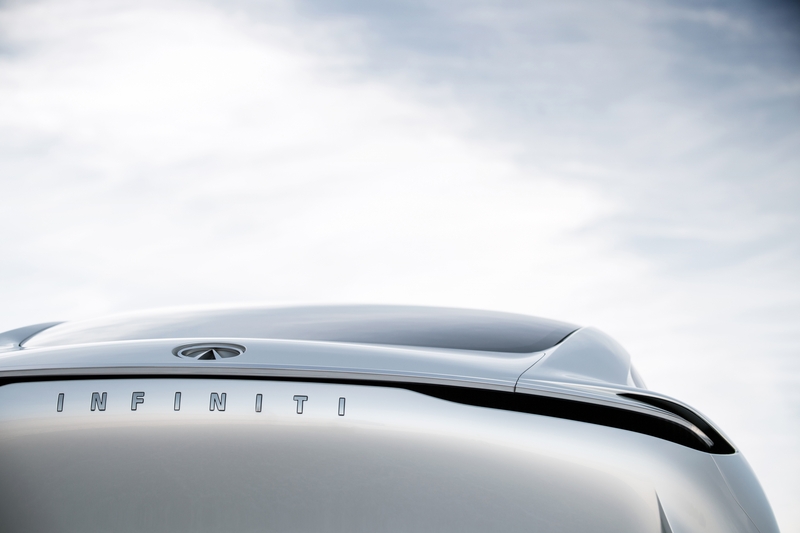 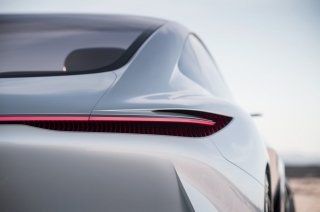 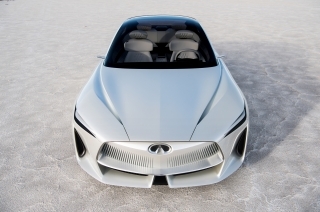 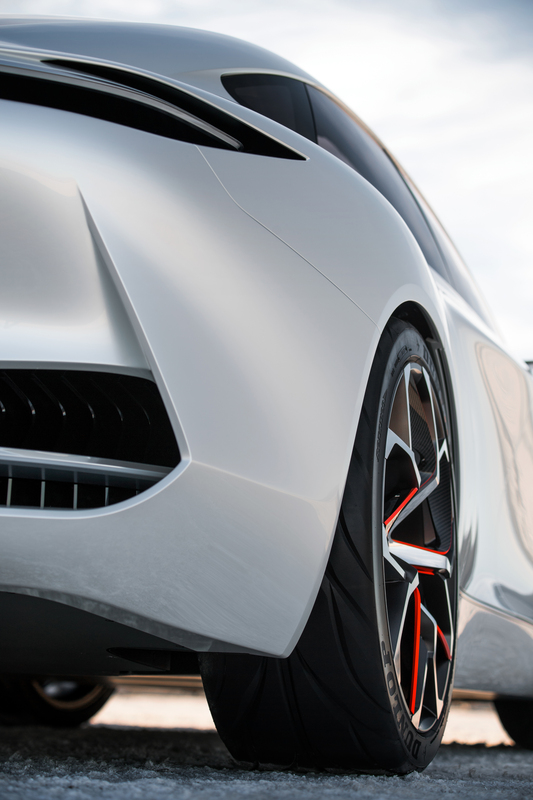 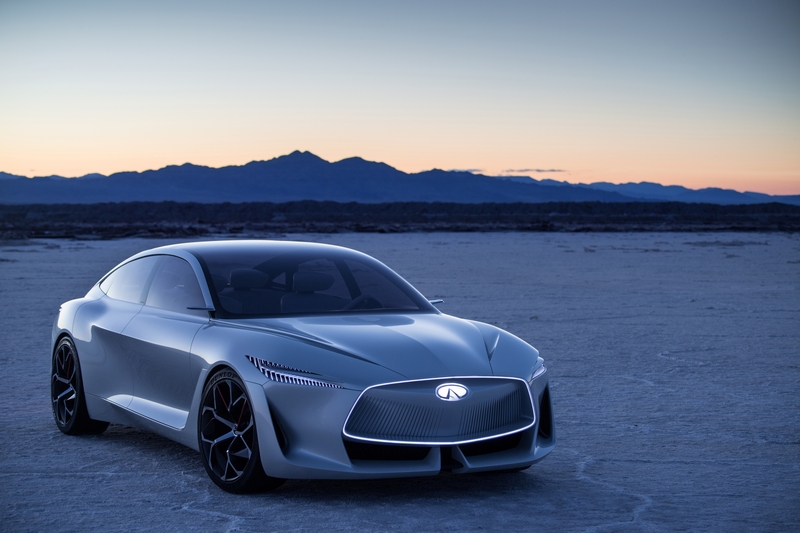 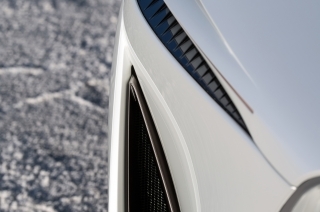 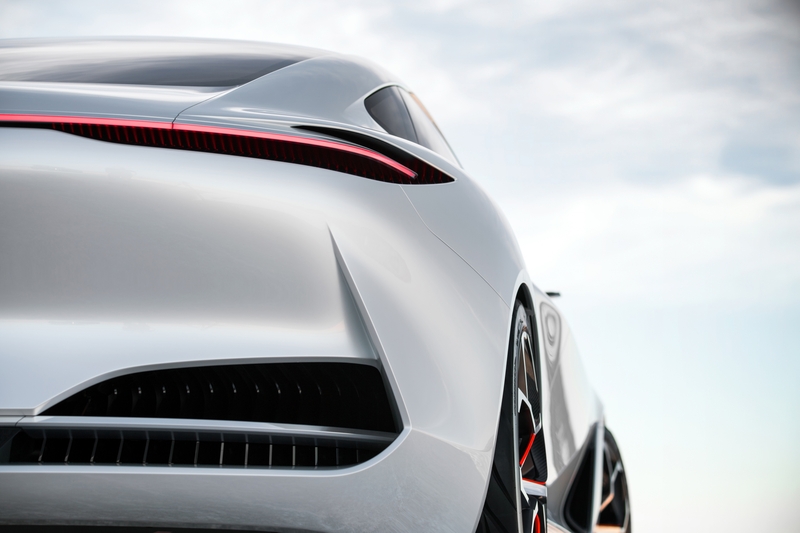 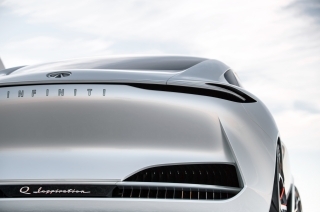 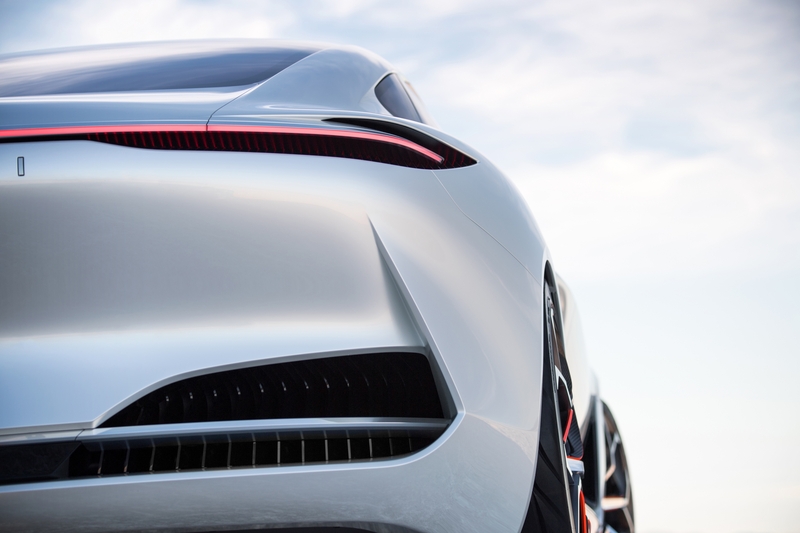 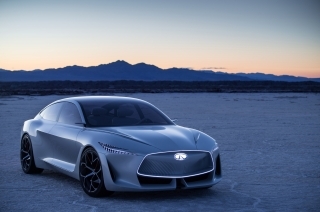 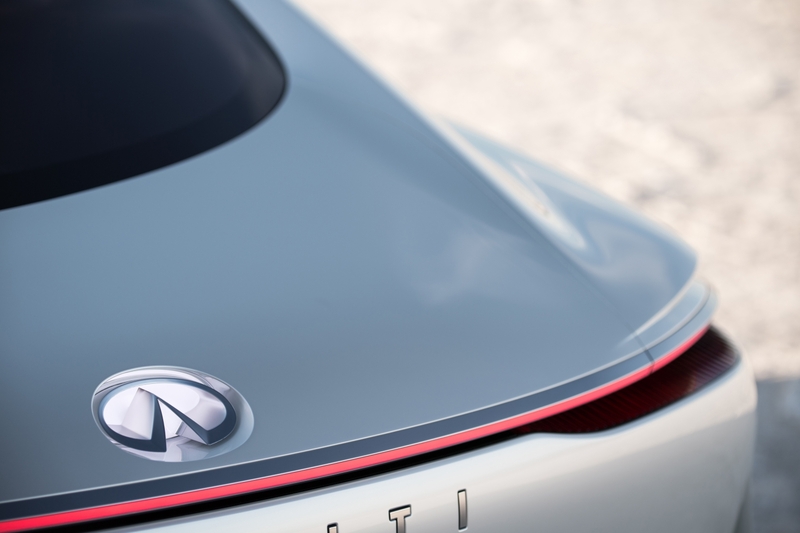 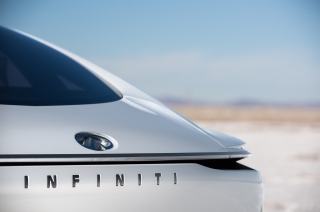 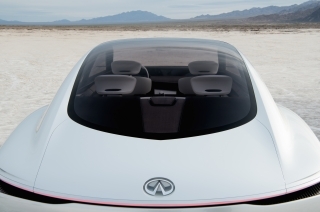 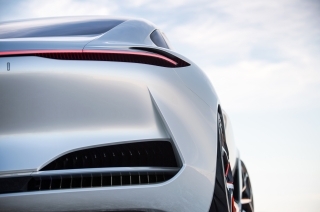 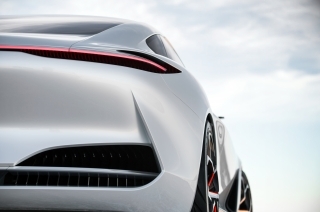 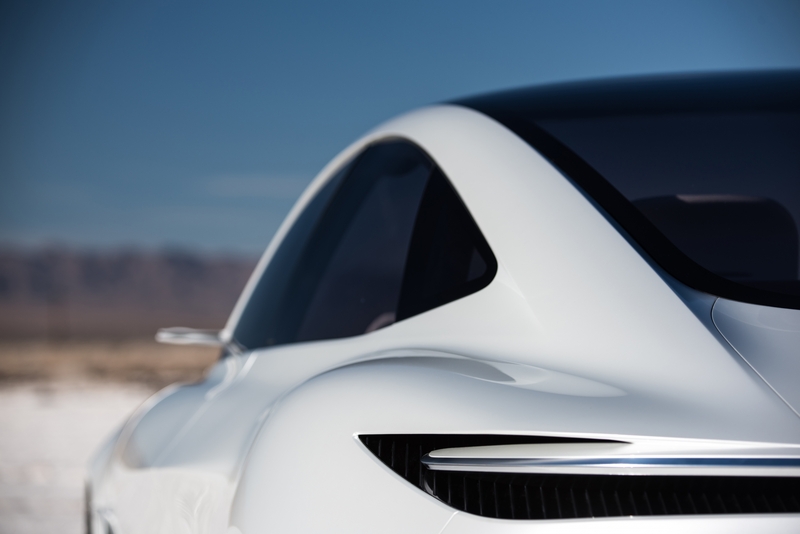 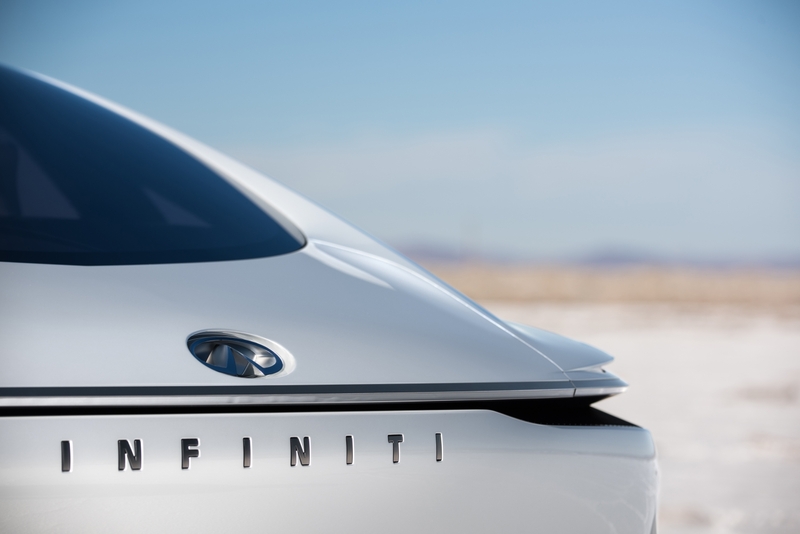 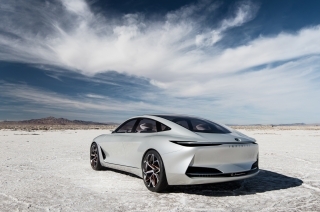 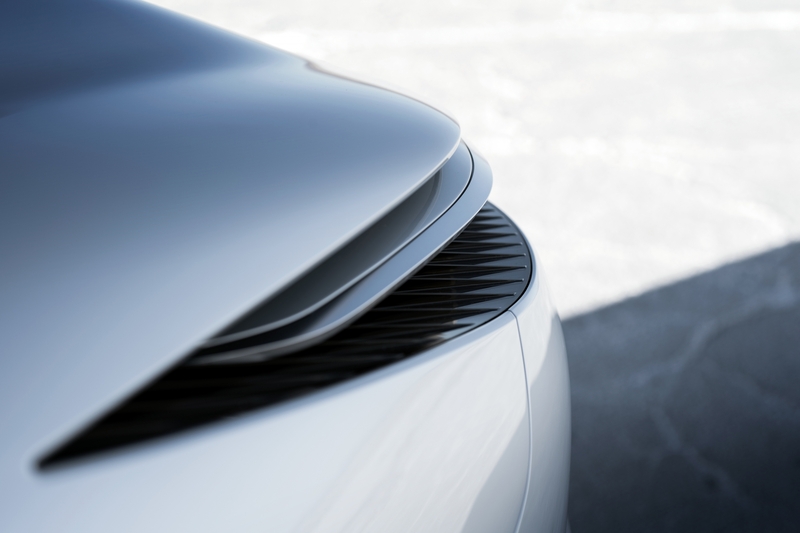 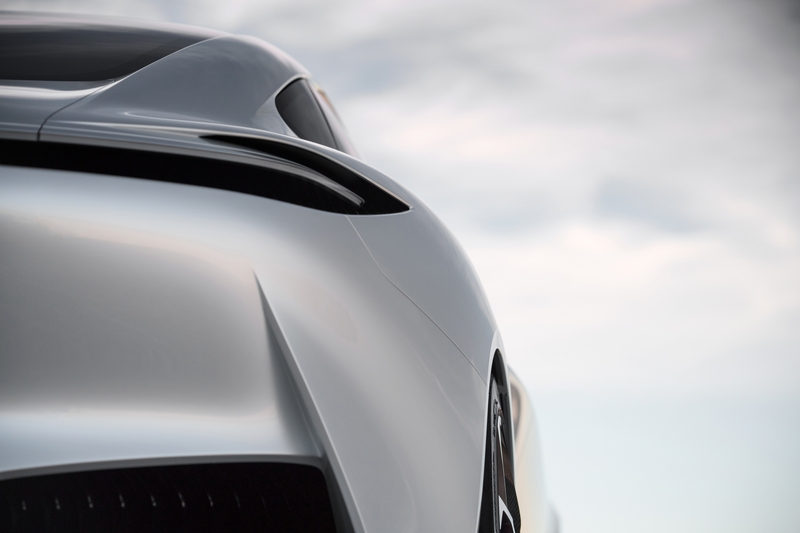 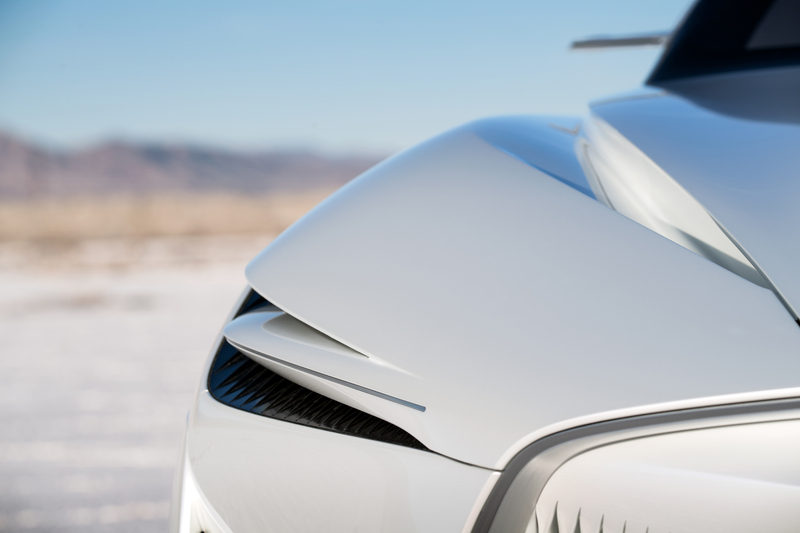 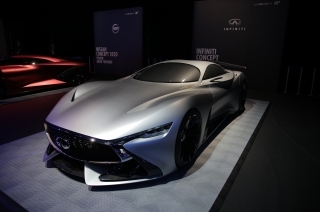 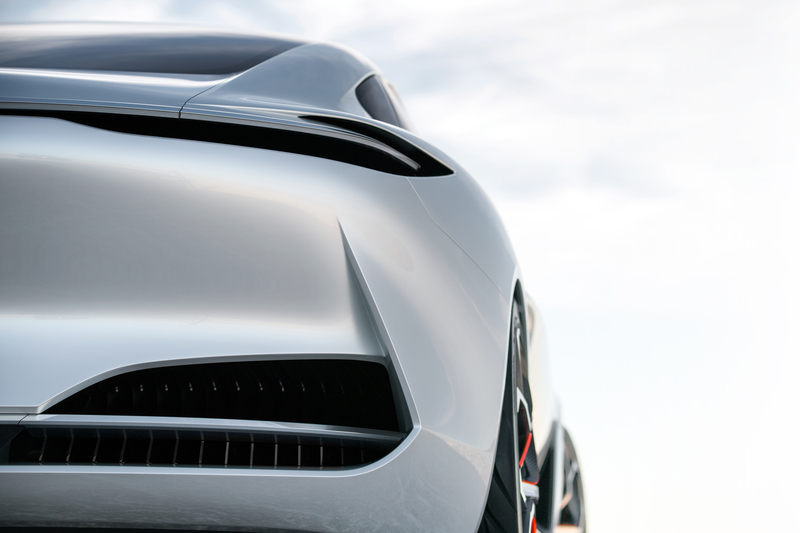 The concept eschews classical sedan forms with coupe-like proportions and an elongated silhouette, demonstrating INFINITI’s design vision for vehicles in this segment. 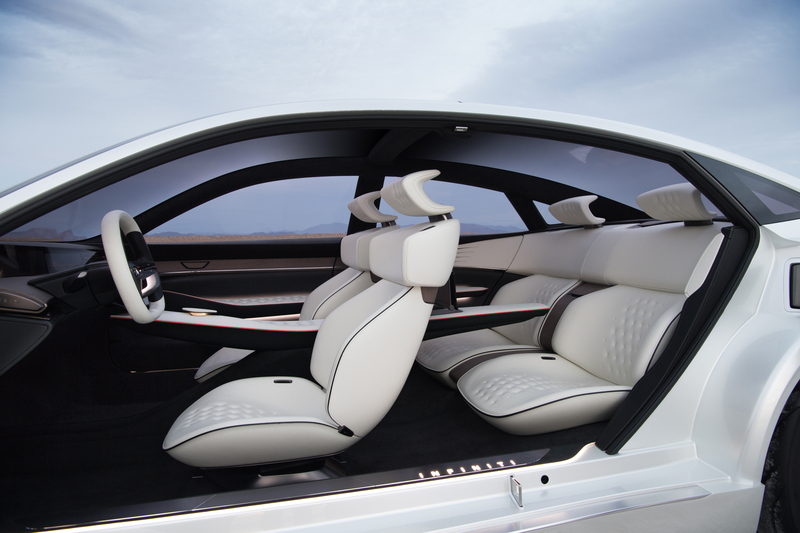 The cabin follows a minimalist approach, enveloping the driver and passengers in a serene and comfortable environment. 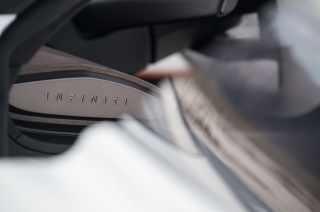 The intelligently-packaged four-cylinder VC-Turbo has liberated INFINITI’s designers from the constraints of powertrain architecture to realize a spacious interior. 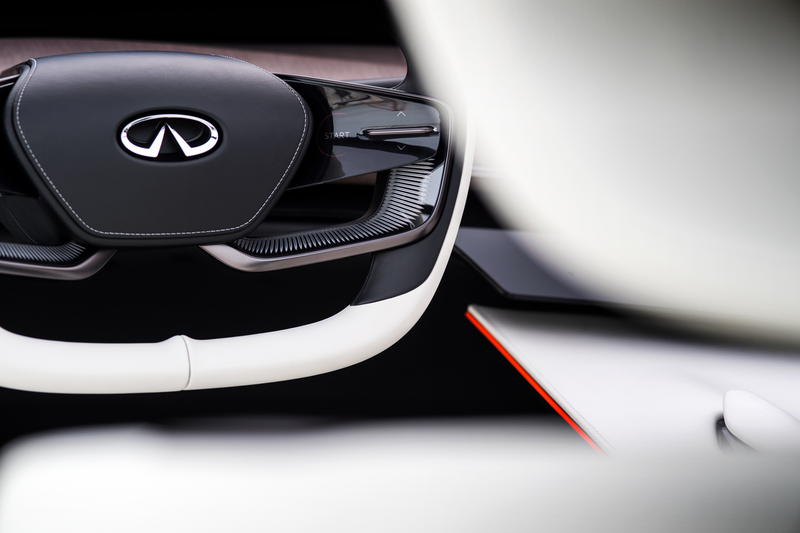 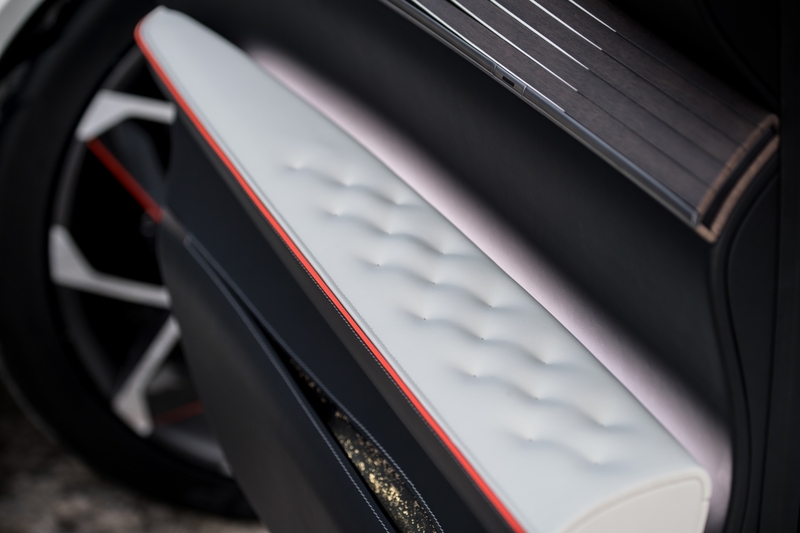 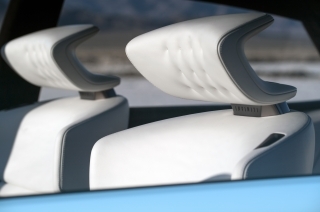 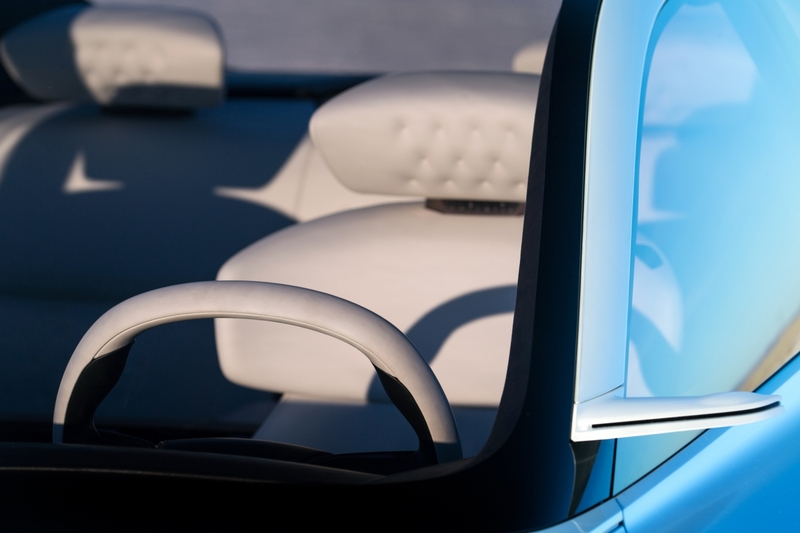 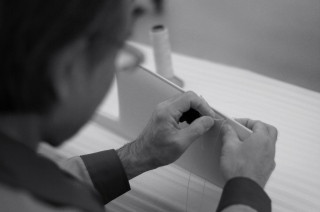 Modern technology and craftsmanship merge inside the cabin, empowering the driver. 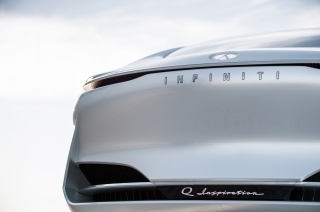 Powered by INFINITI’s breakthrough VC-Turbo technology, the Q Inspiration boasts a revolutionary powertrain combining turbocharged gasoline power with the torque and efficiency of a hybrid or diesel engine. 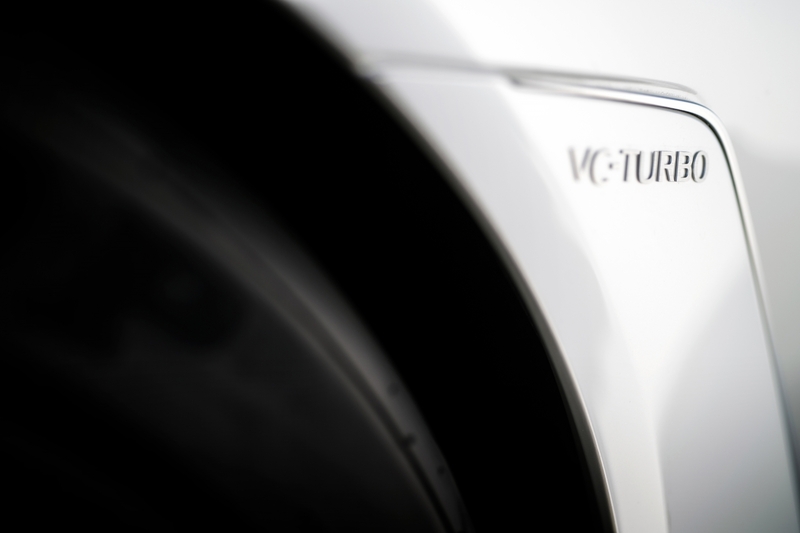 VC-Turbo continually transforms, adjusting its compression ratio to optimize power and fuel efficiency, resulting in the smart application of power for greater driver control. 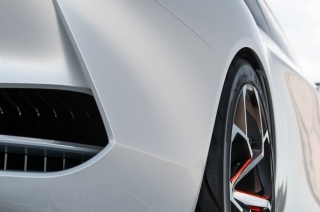 As a mid-size sedan concept, the Q Inspiration previews other near-future applications for INFINITI’s variable compression ratio VC-Turbo engine technology. 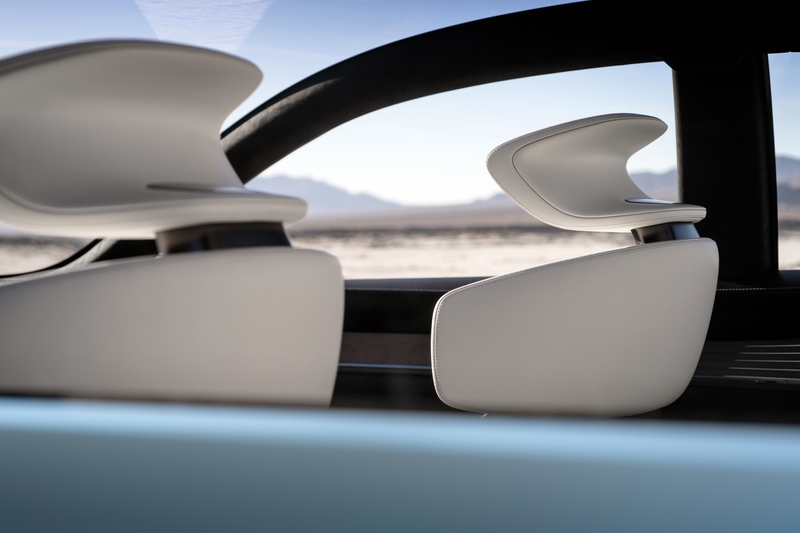 New ProPILOT functionality liberates the driver from mundane and stressful driving situations. 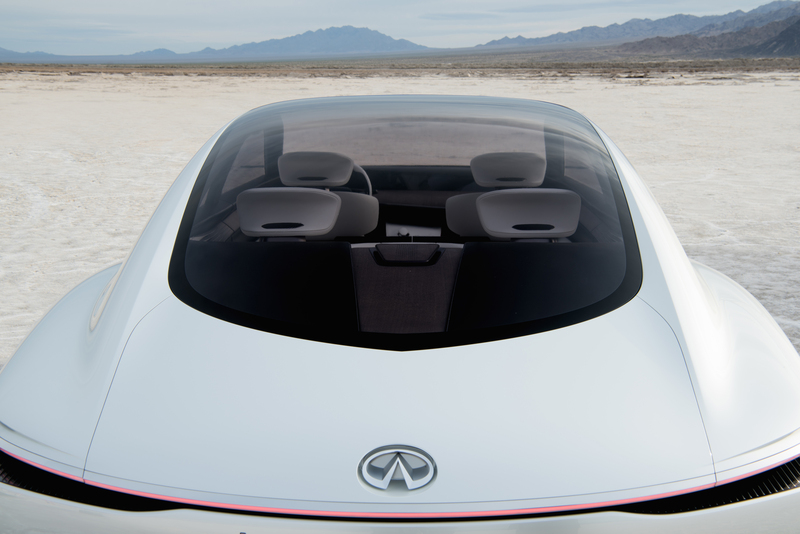 Realizing the next stage in vehicle autonomy for INFINITI, ProPILOT enables drivers to delegate more stressful driving tasks to the car, and enjoy an enhanced ability to respond to hazards. 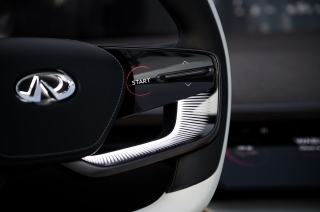 With the system acting as a ‘co-pilot’, the driver always retains ultimate control. 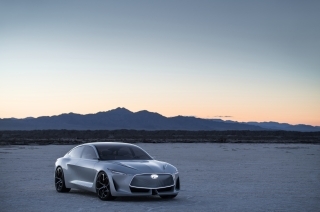 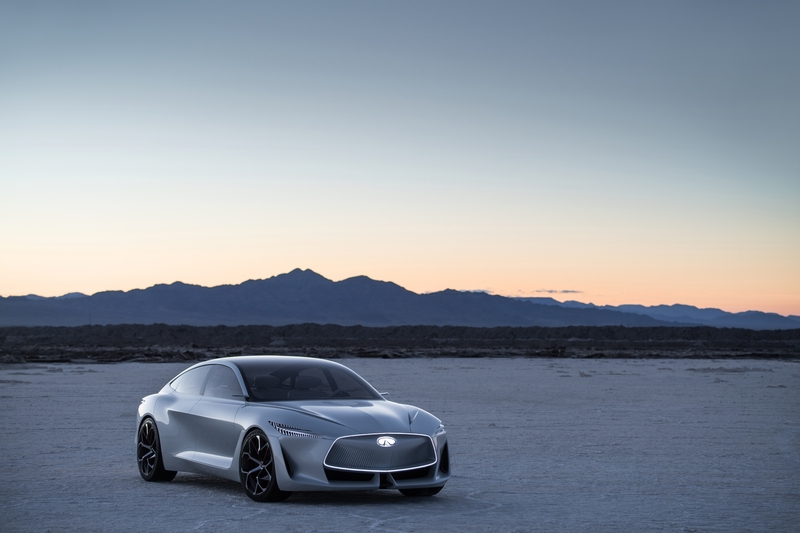 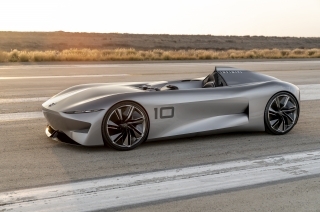 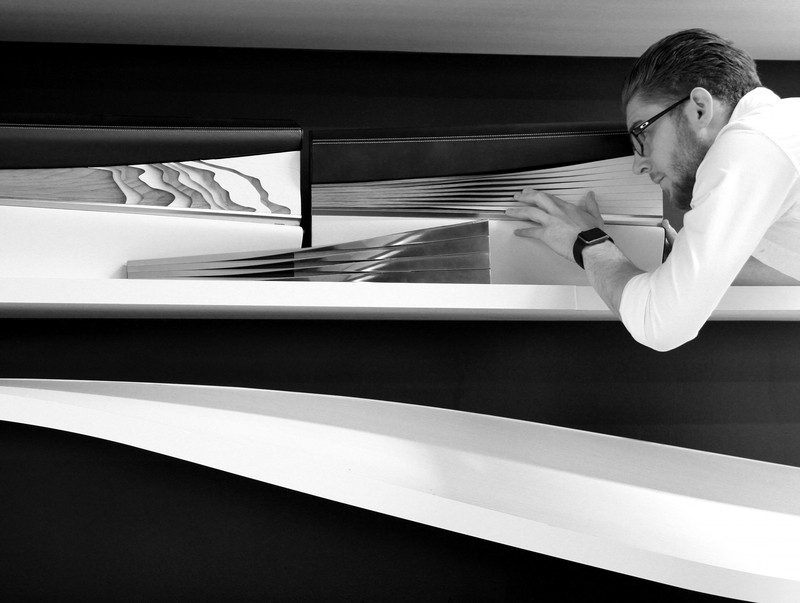 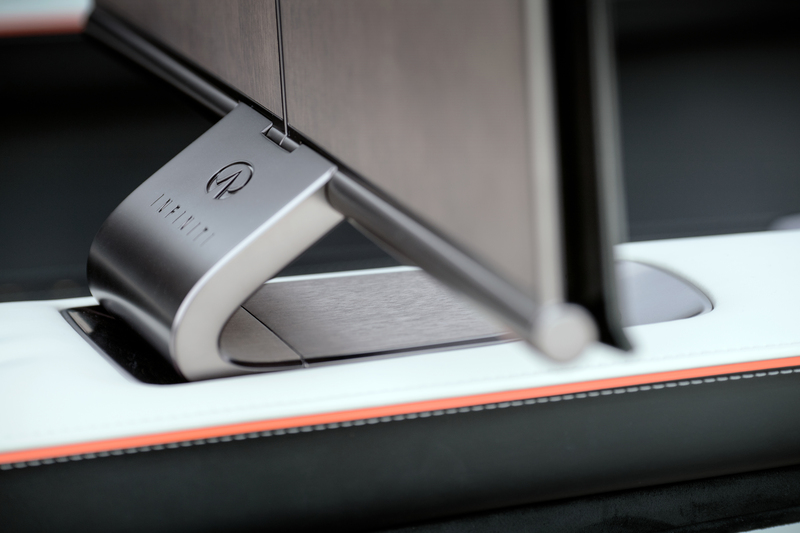 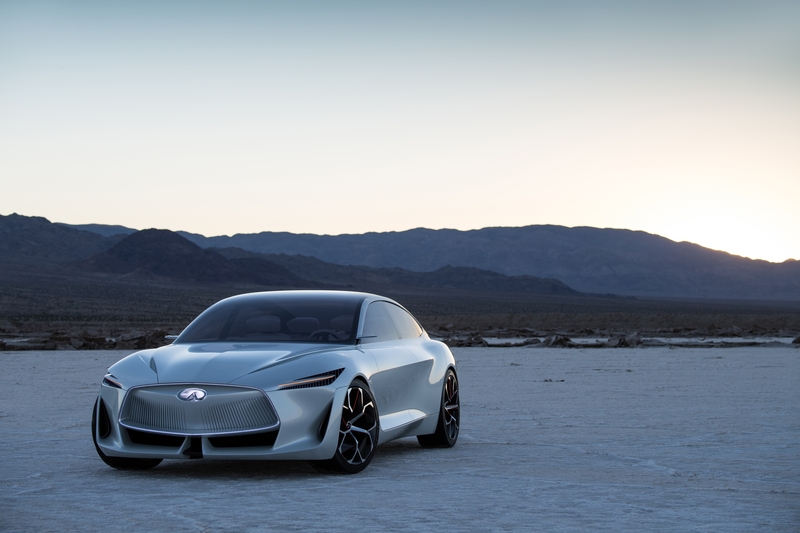 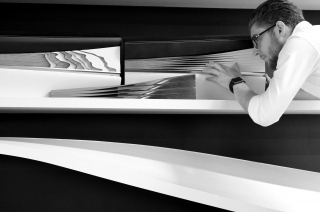 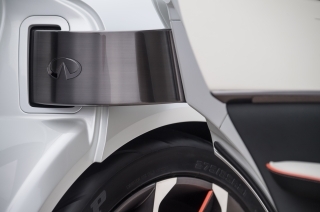 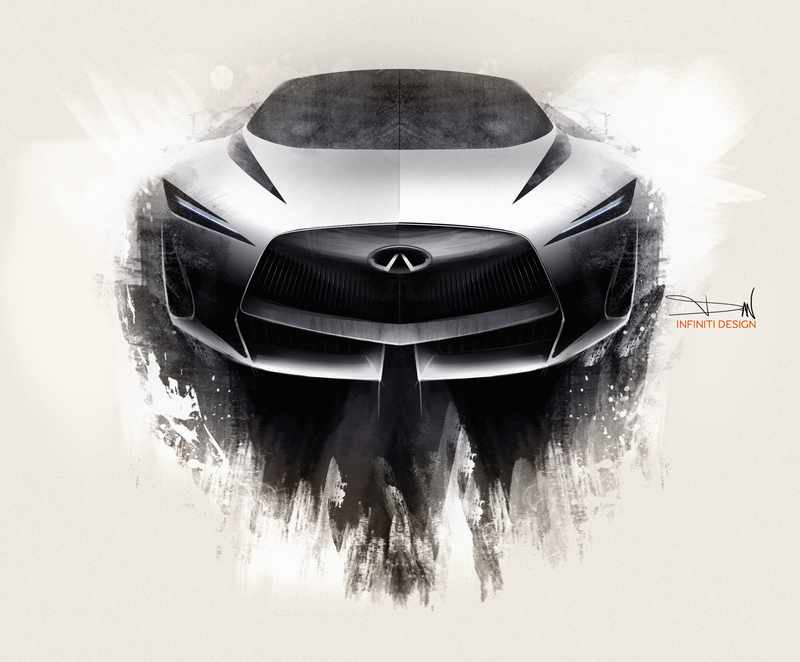 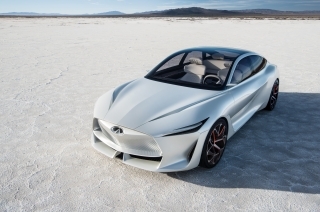 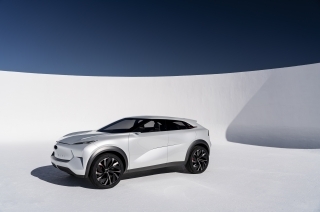 The Q Inspiration Concept represents the first manifestation of INFINITI’s new form language, characterized by advanced powertrains and a shift towards lower emissions. 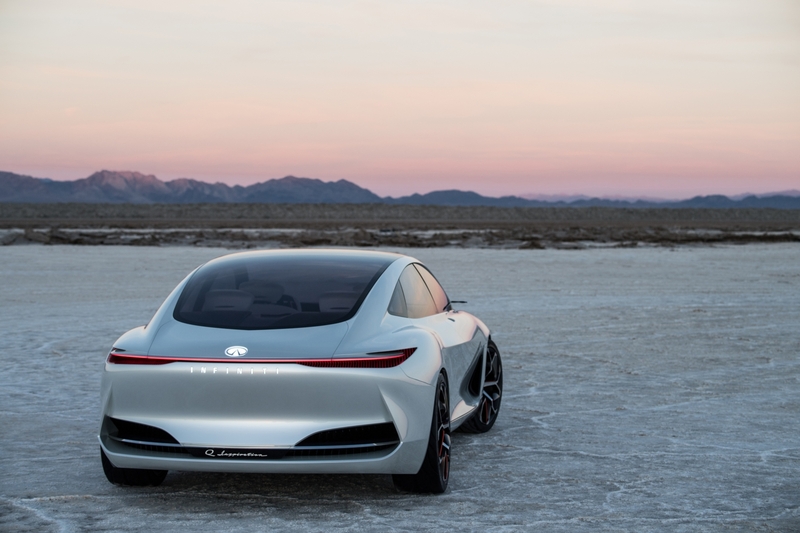 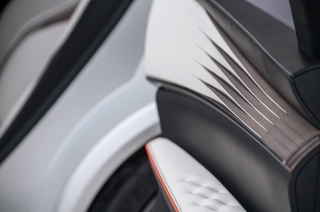 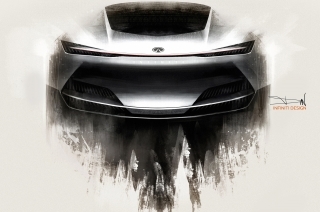 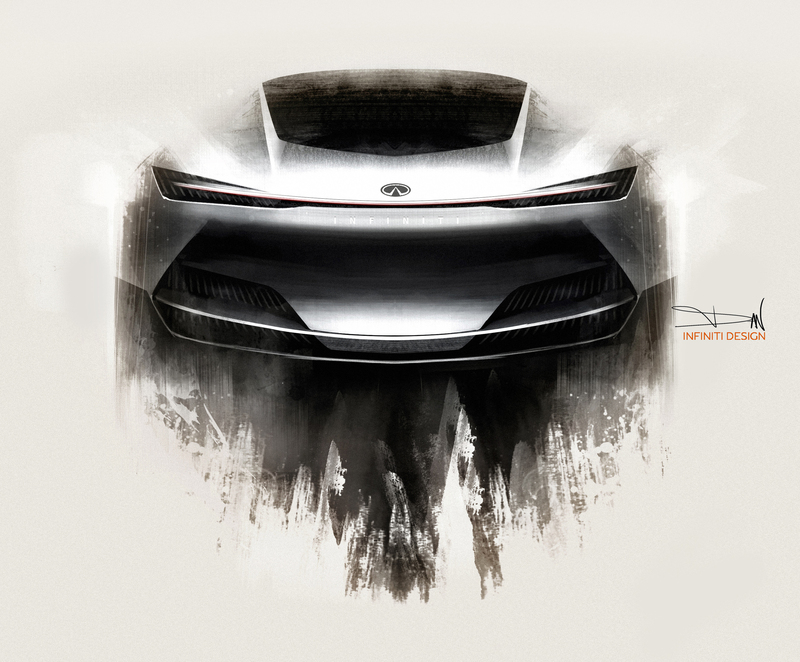 More technical in execution than existing INFINITI production cars and concept vehicles, the brand’s new design language adopts straight lines, concise graphics and clean surfaces. 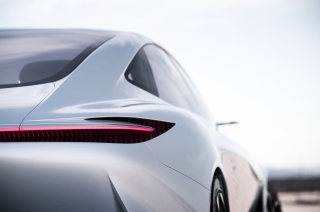 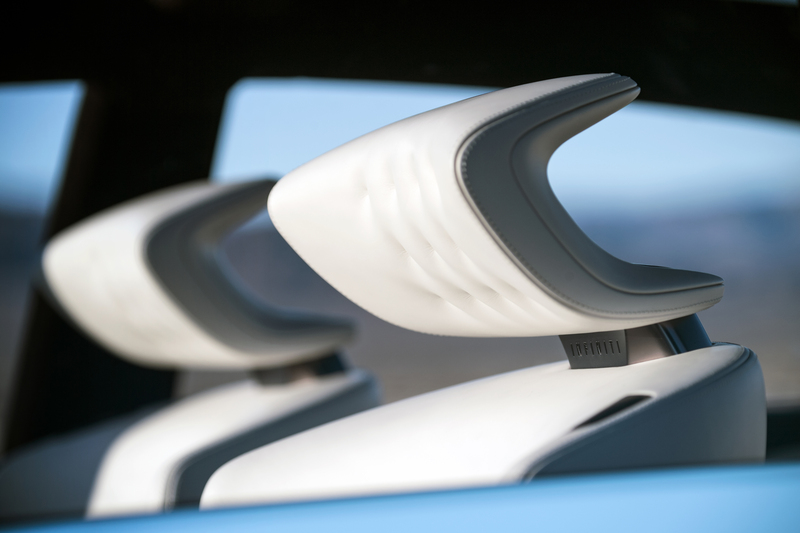 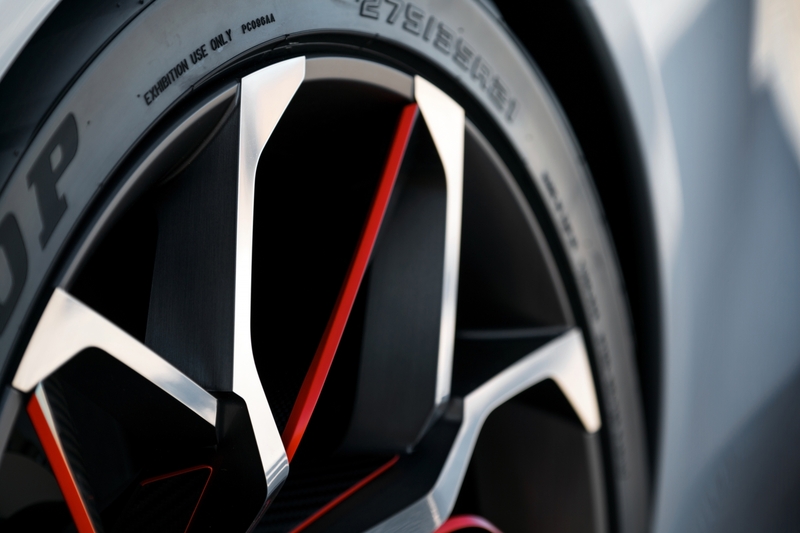 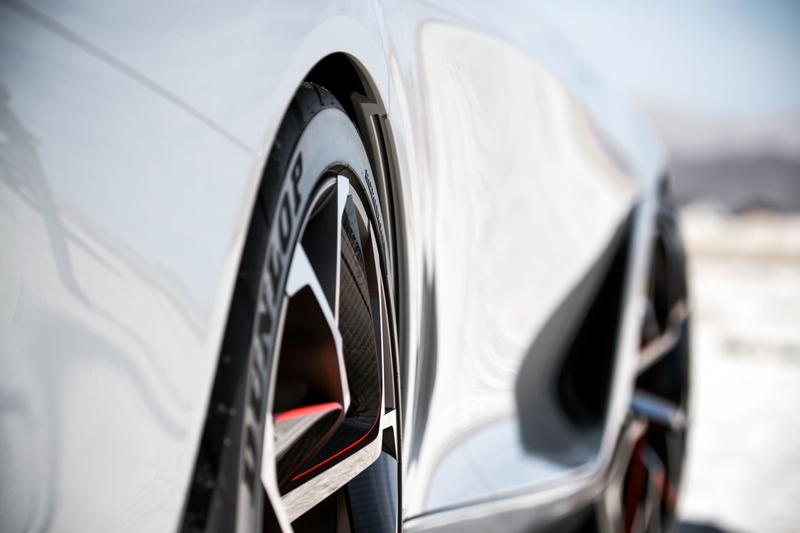 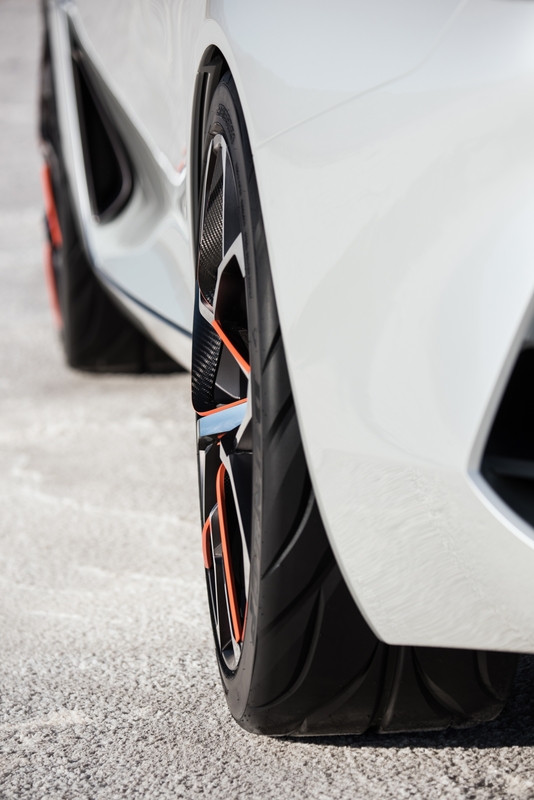 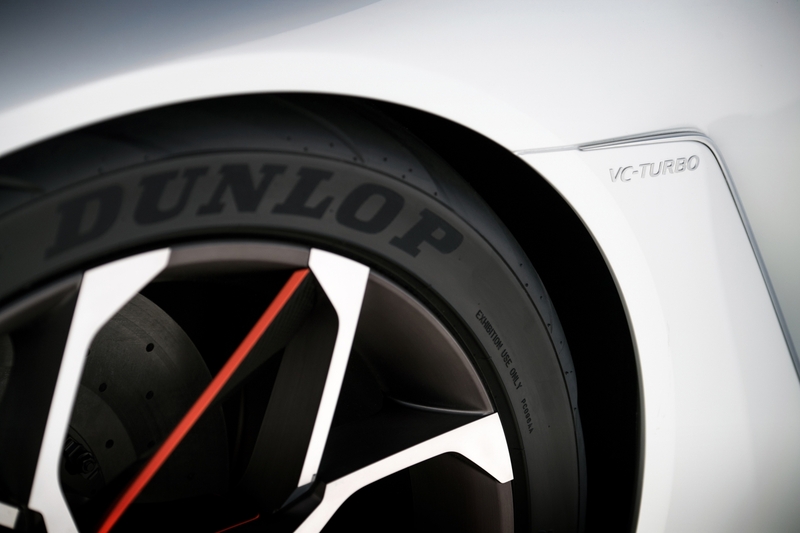 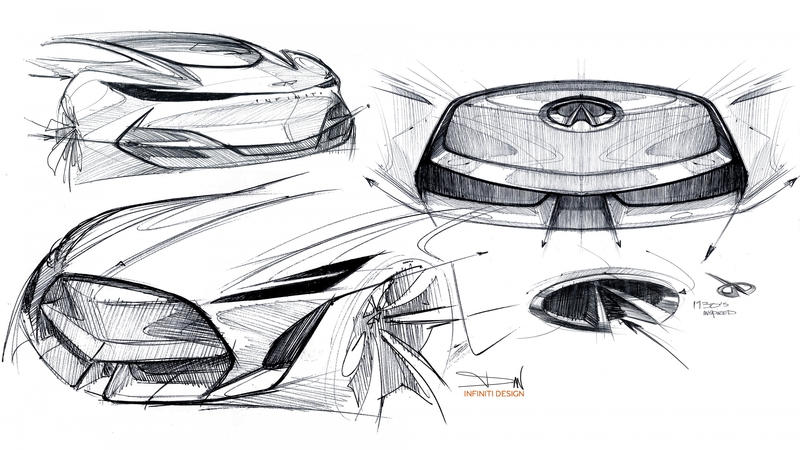 The result is a pure and simple – yet muscular – design execution inspired by modern powertrain technologies. 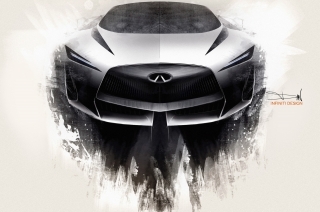 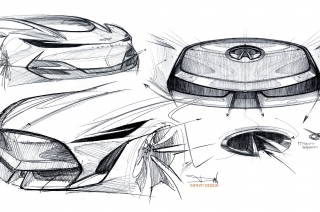 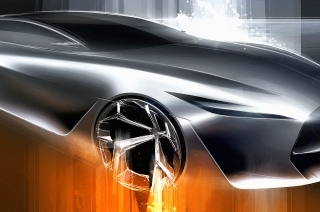 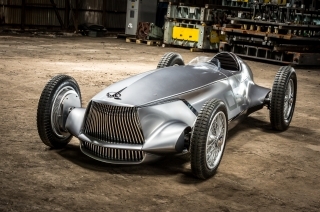 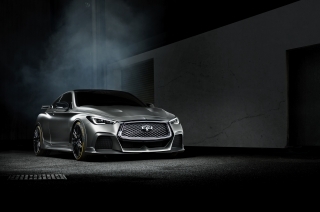 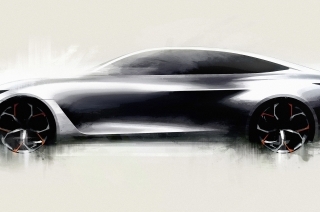 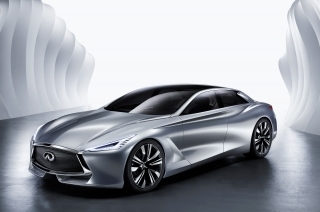 The impending adoption of more advanced forms of propulsion has allowed INFINITI’s designers to propose a new architecture for the mid-size sedan. 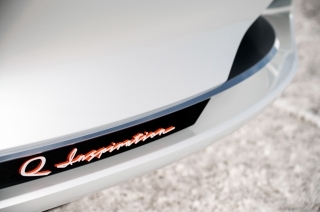 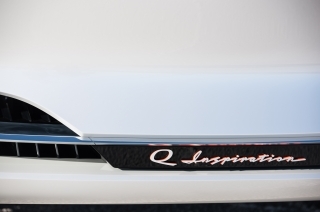 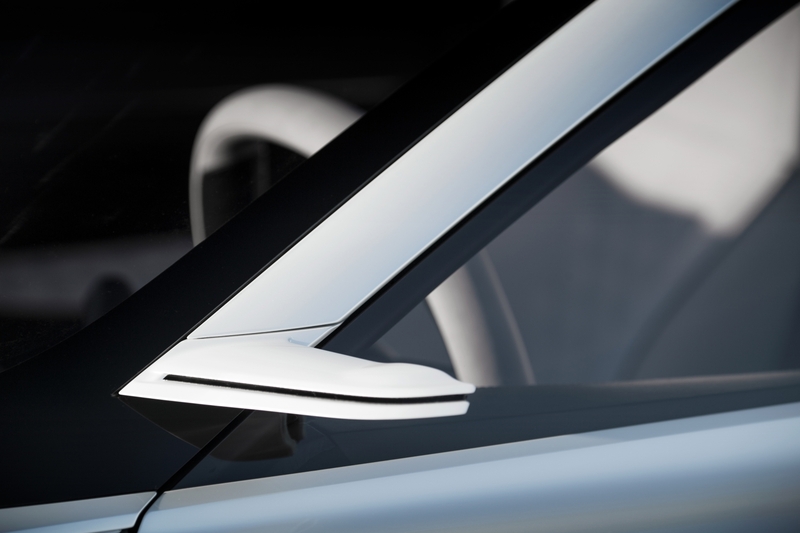 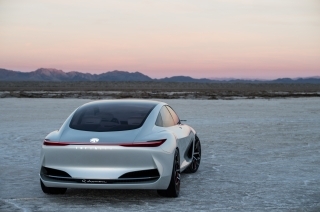 The Q Inspiration eschews classical sedan forms in favor of more coupe-like proportions and an elongated silhouette. Its short hood segues into a long cabin, made possible by the powerful yet compact VC-Turbo engine under its hood. 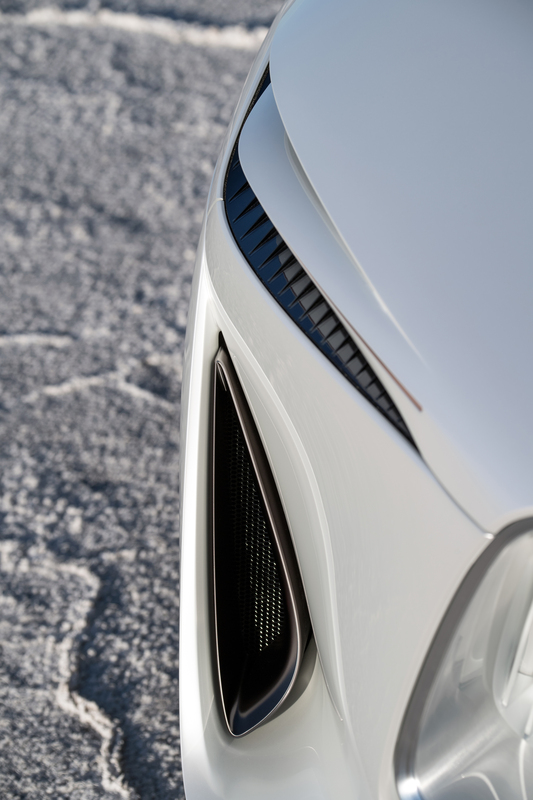 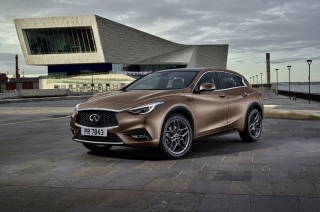 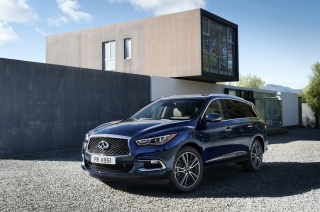 The front of the car is dominated by a large double-arch grille, echoing the signature design of existing INFINITI vehicle, yet exhibiting a more obsessive and technical level of execution. 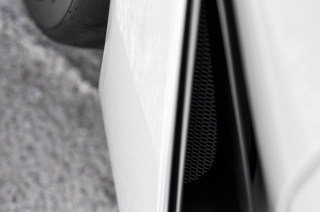 The appearance of the grille is matched with sharp louvres running up the sides of the hood, and blade-like vents fore and aft of the wheels. 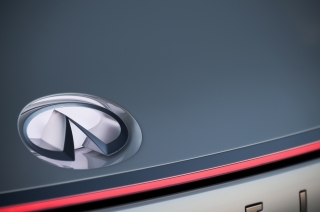 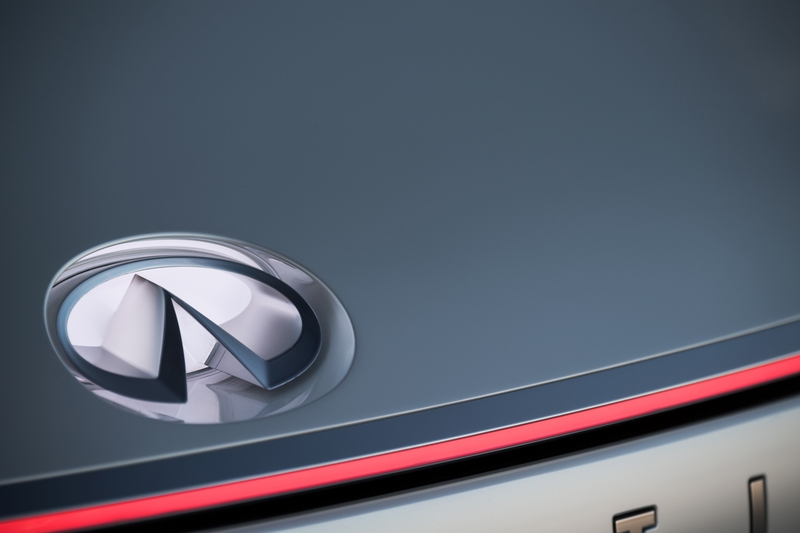 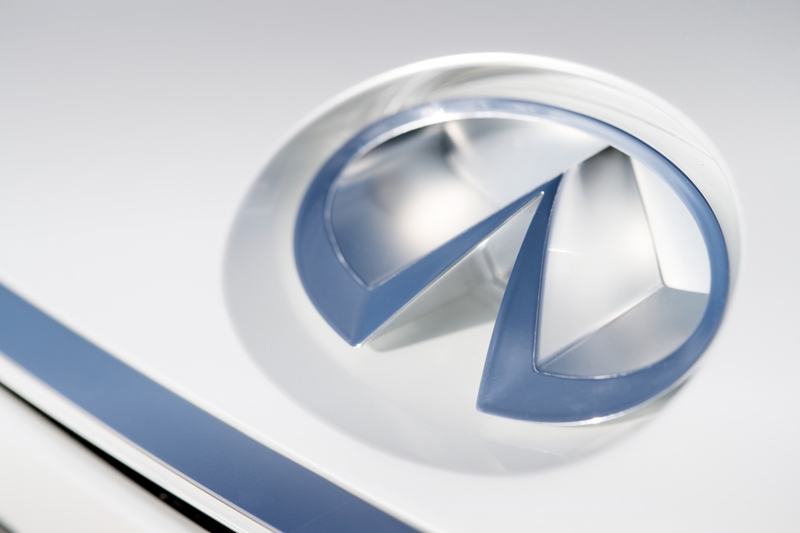 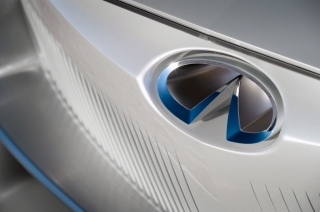 INFINITI’s hallmark ‘human-eye’ headlamps have evolved to accommodate precise LED strip headlamps. 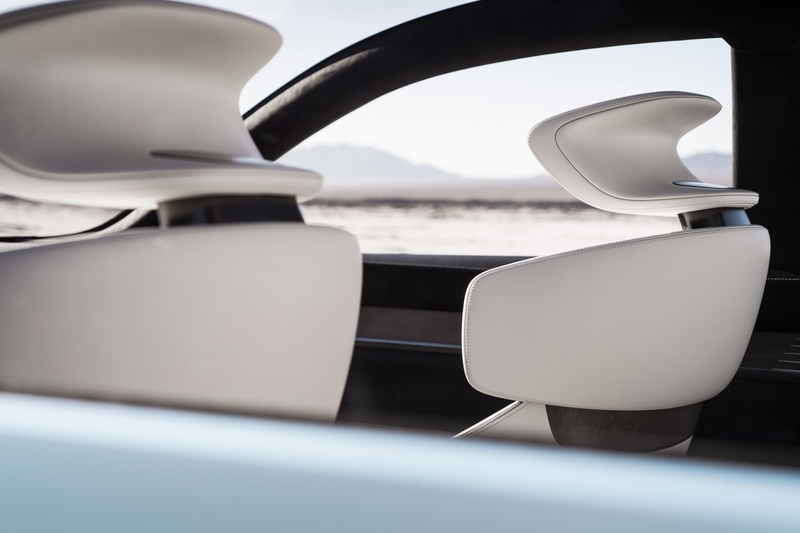 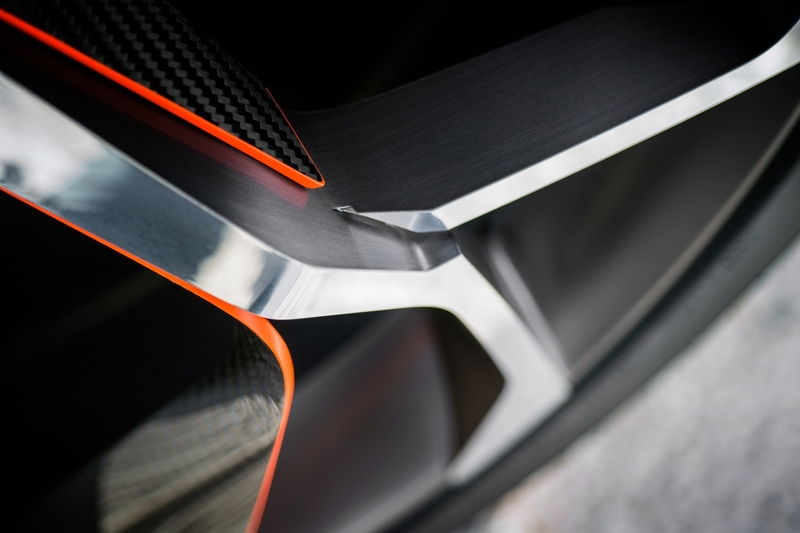 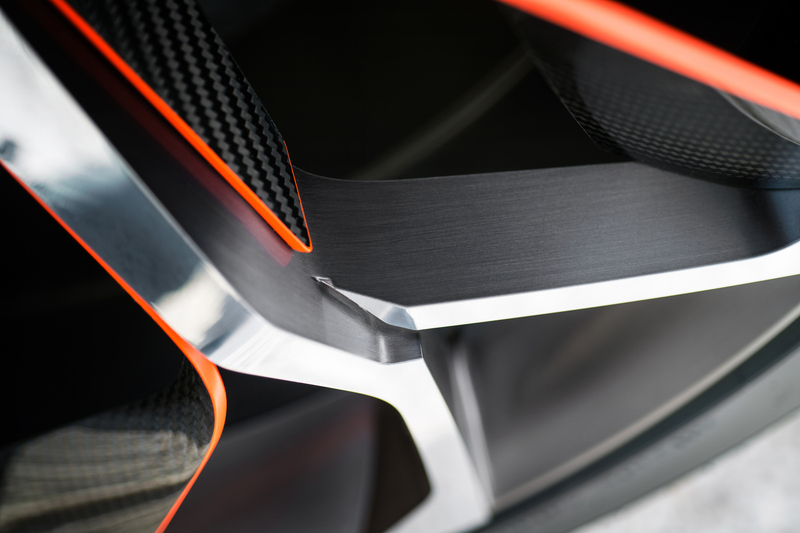 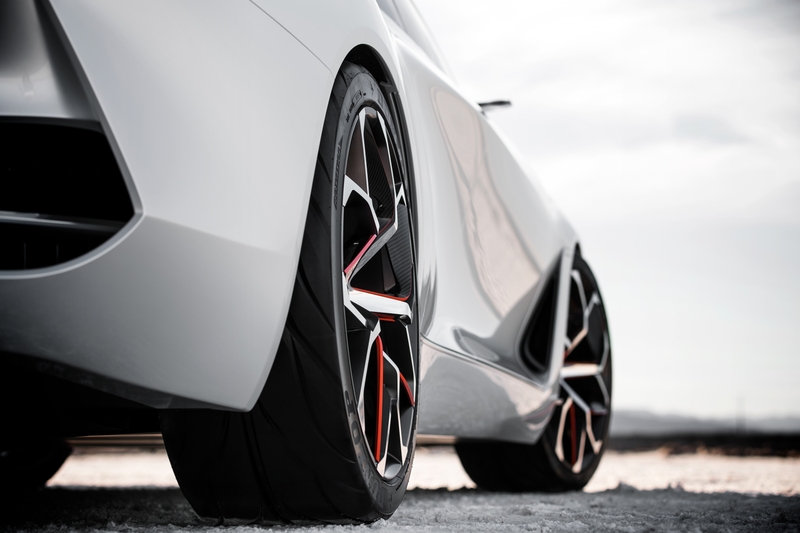 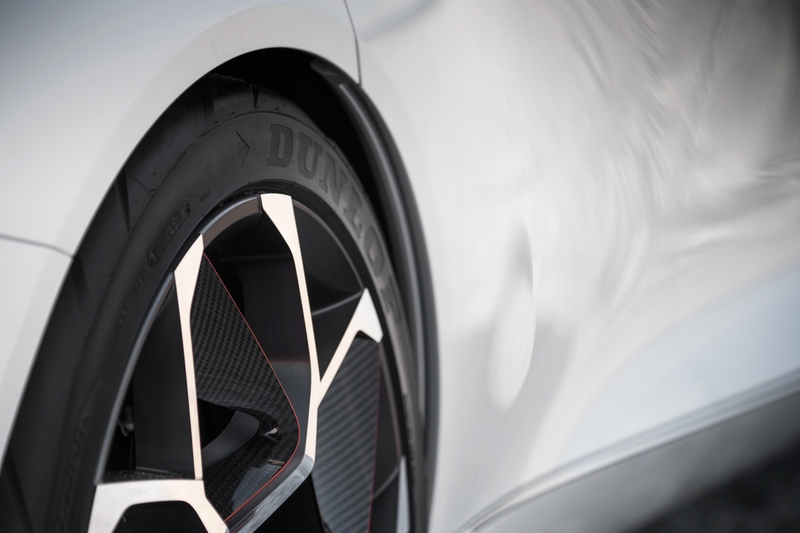 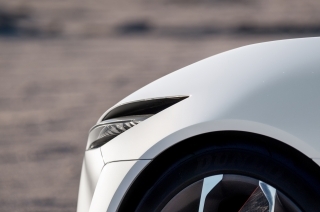 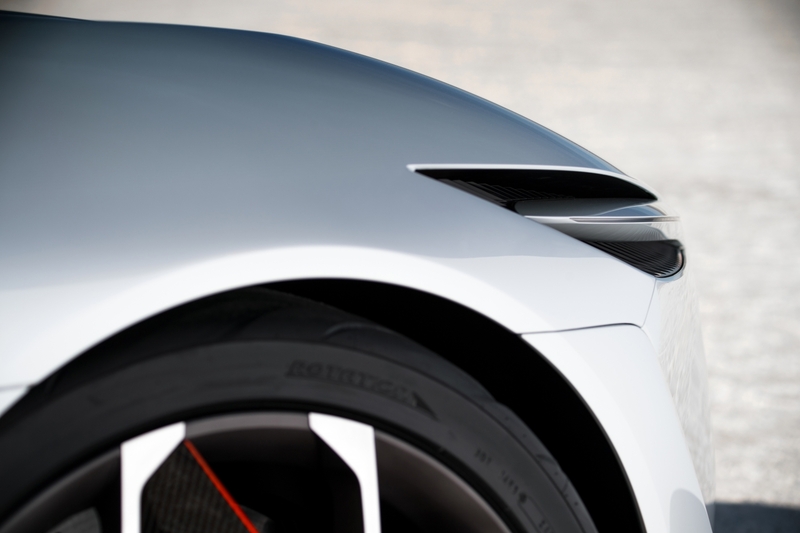 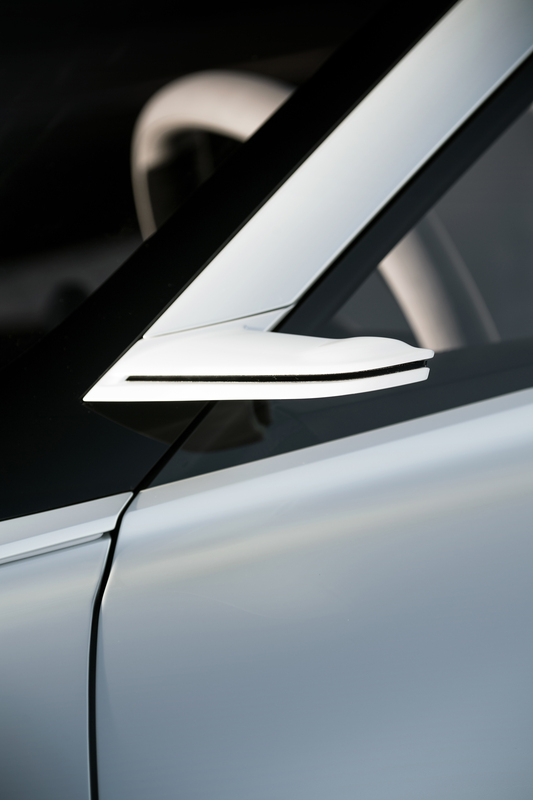 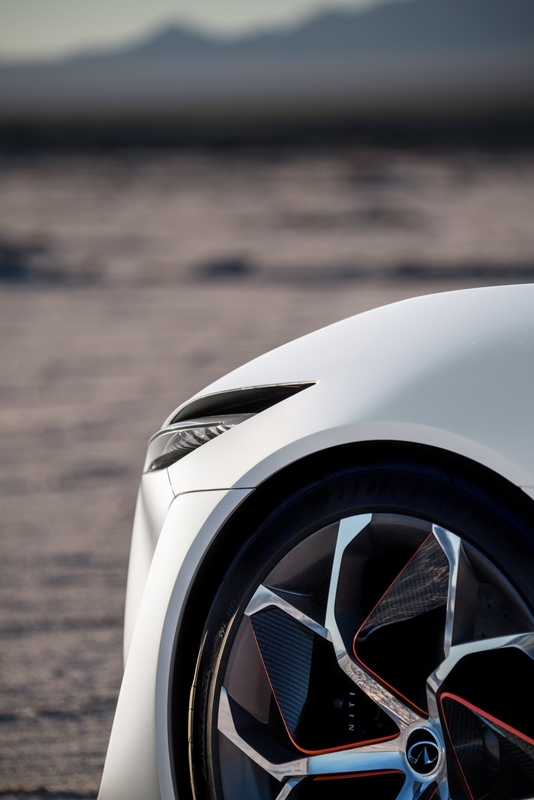 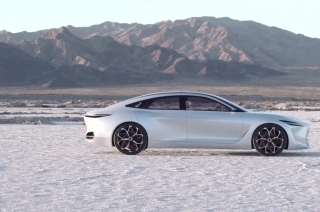 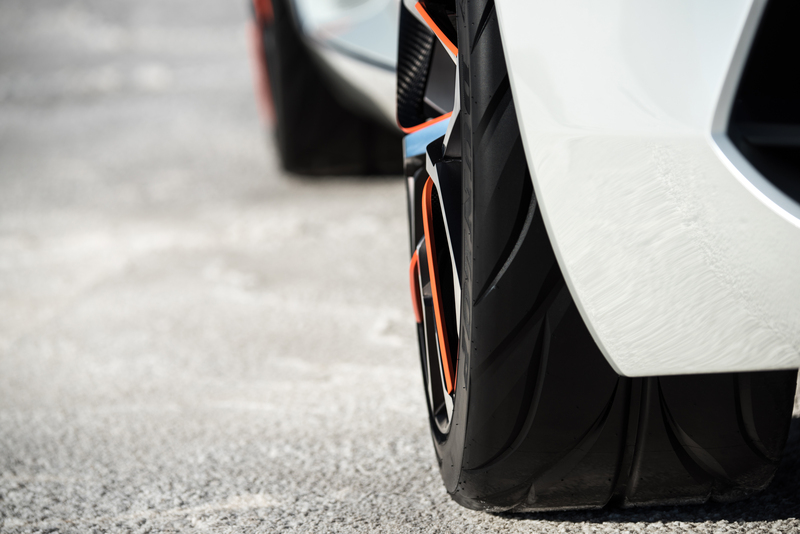 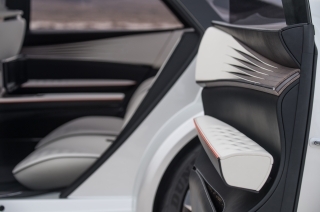 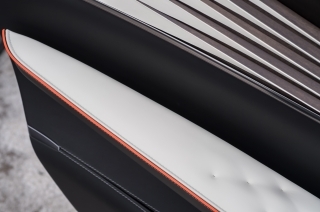 Extending rearwards from the slashes on the bonnet, precise shoulder lines blend into the smoother bodywork of the mid-section of the concept, across the car’s pillarless rear-hinged doors. 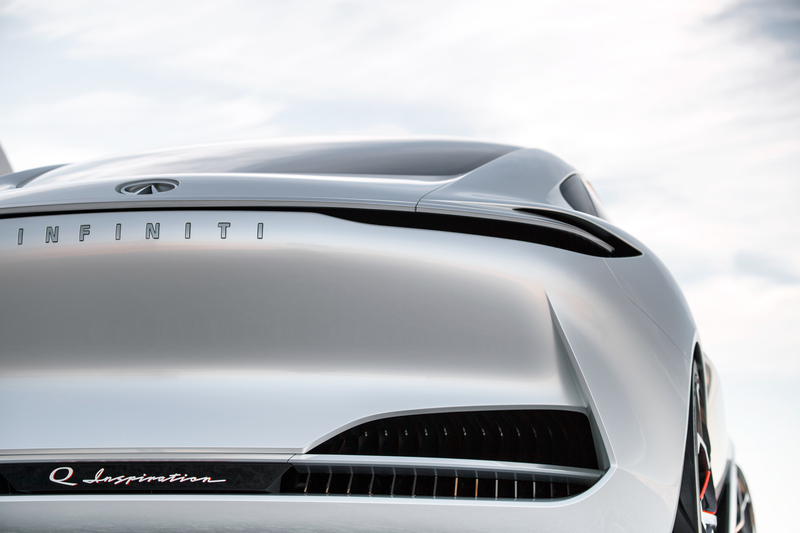 The shoulder reappears towards the rear of the car, exhibiting a sensual, curved quarter and wheel arches, accompanied by a graceful, arcing roof-line flowing into the rear deck. 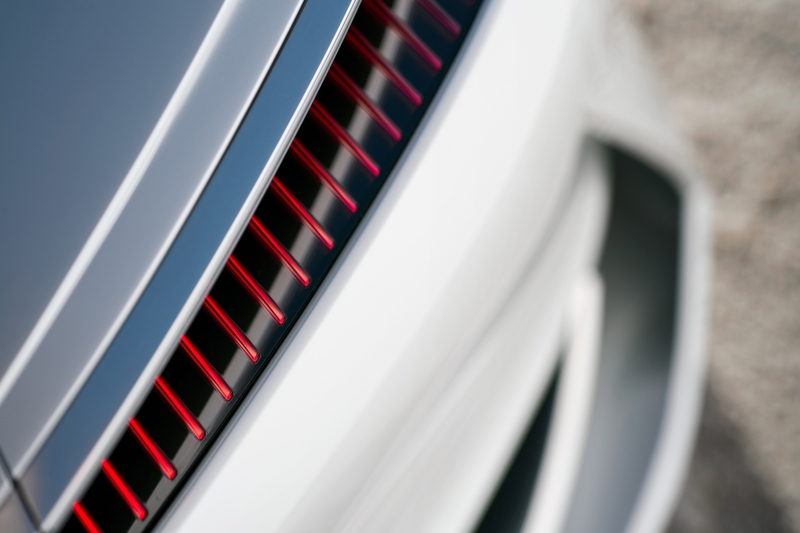 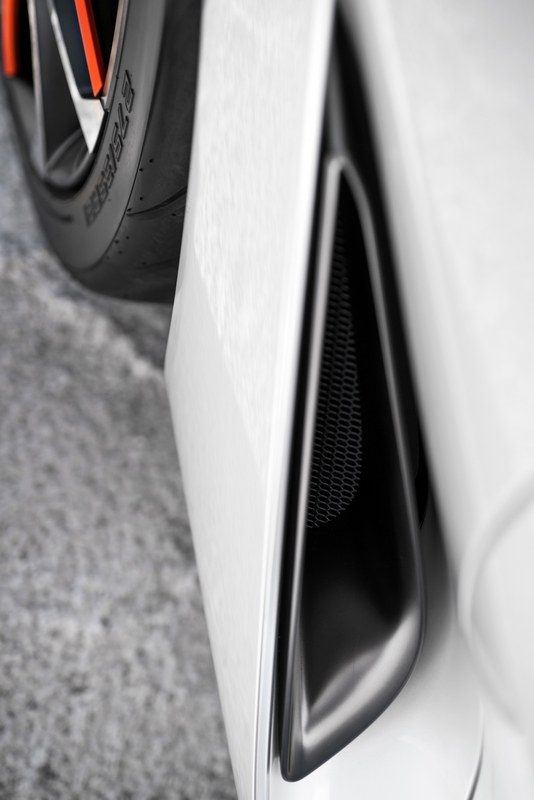 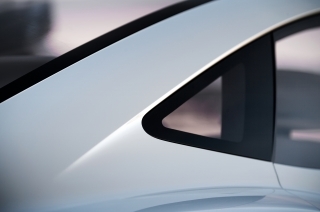 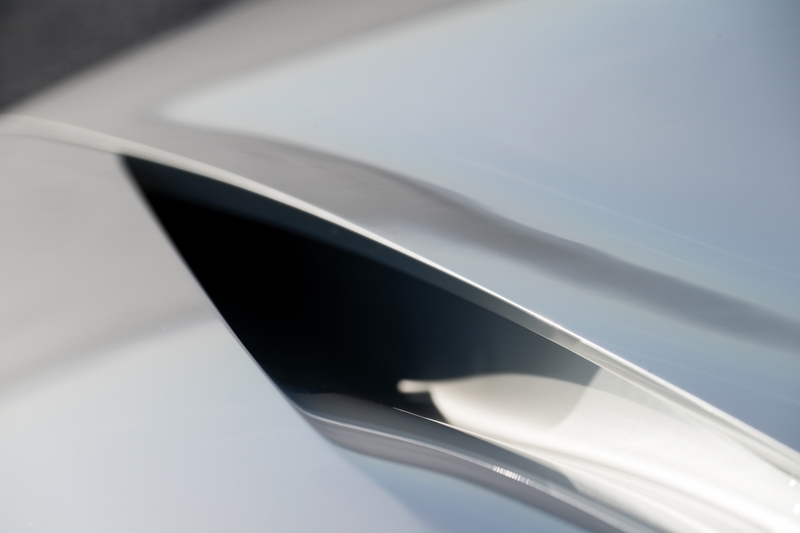 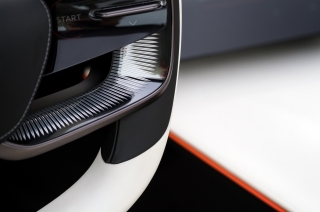 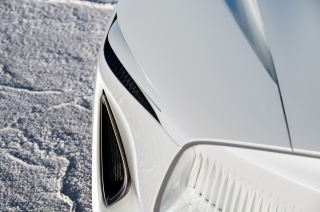 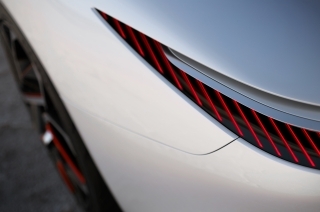 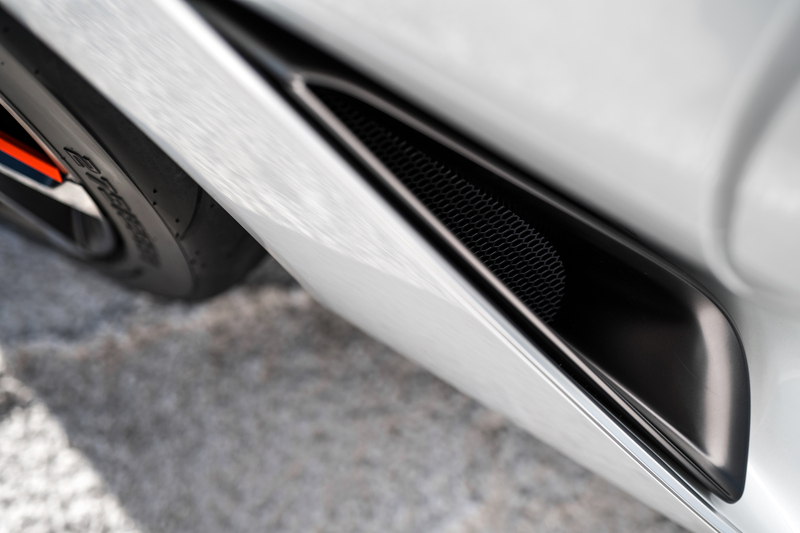 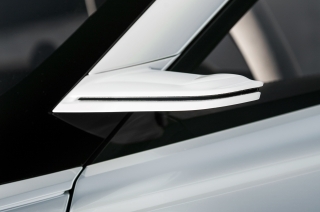 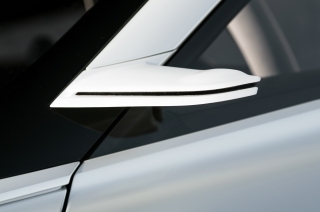 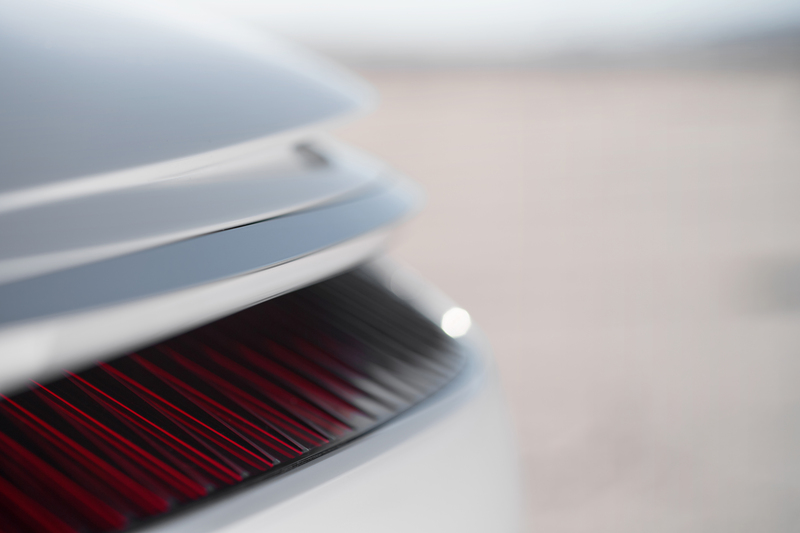 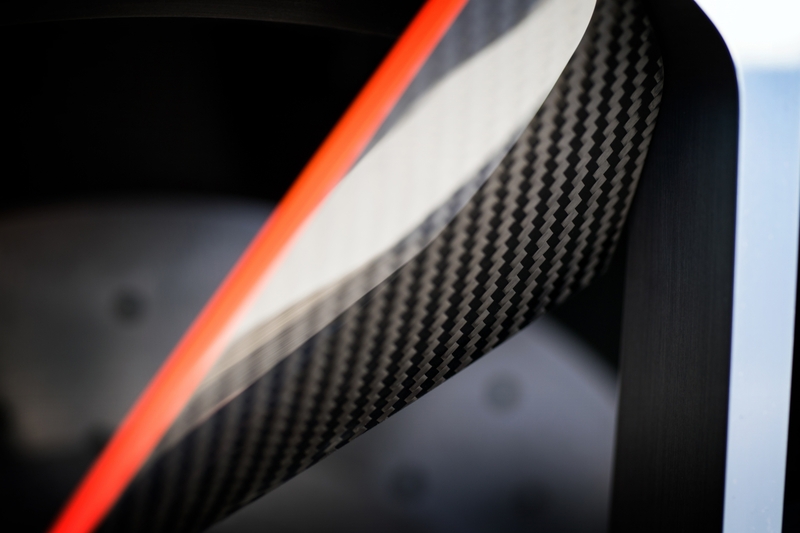 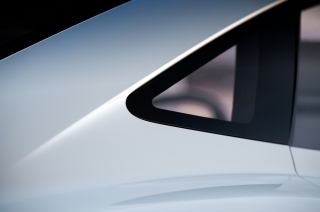 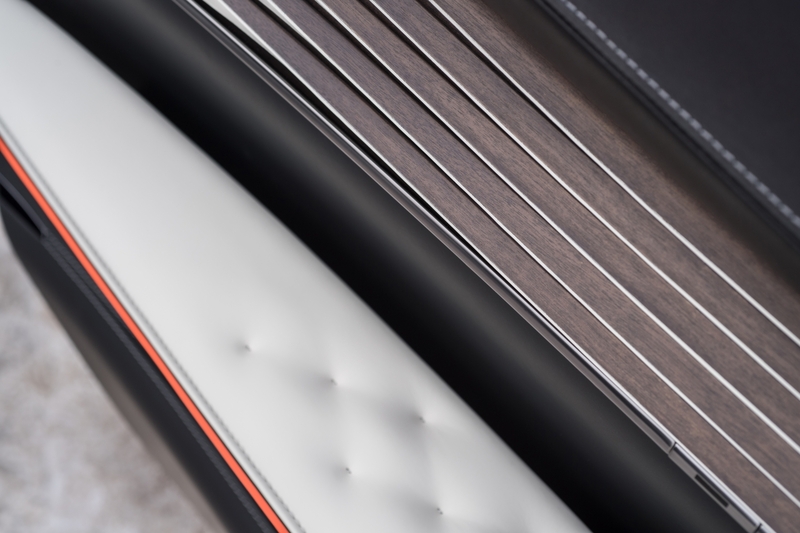 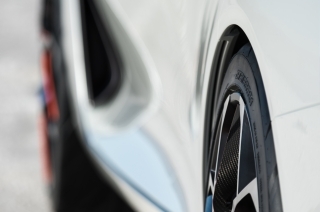 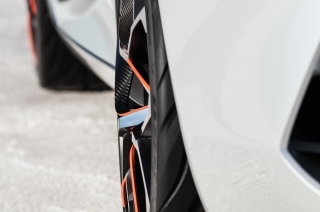 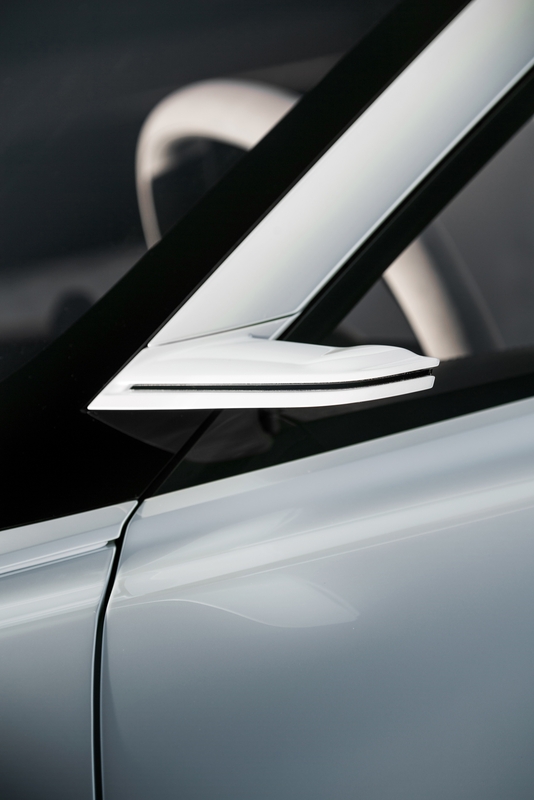 These lines culminate in a single rear light strip beneath a clearly-defined trailing edge. The dashboard is trimmed in carefully-treated kabazakura wood, with an authentic, highly-tactile matte finish whose grain is still detectable to the touch, thanks to a delicate application of clar-coat protection. 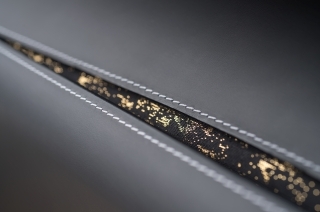 Kabazakura is a member of the birch family. 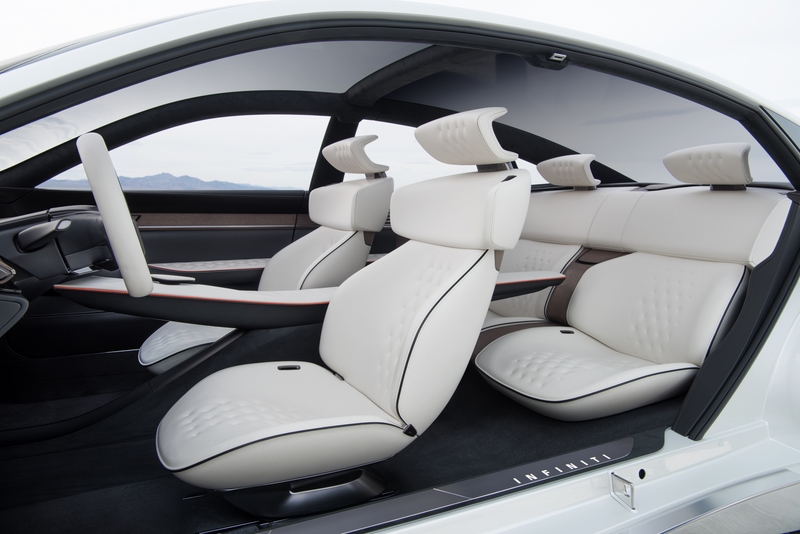 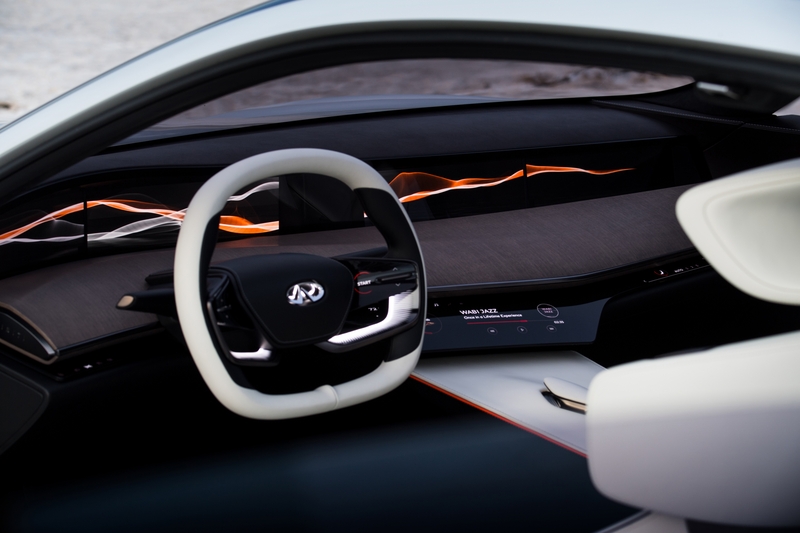 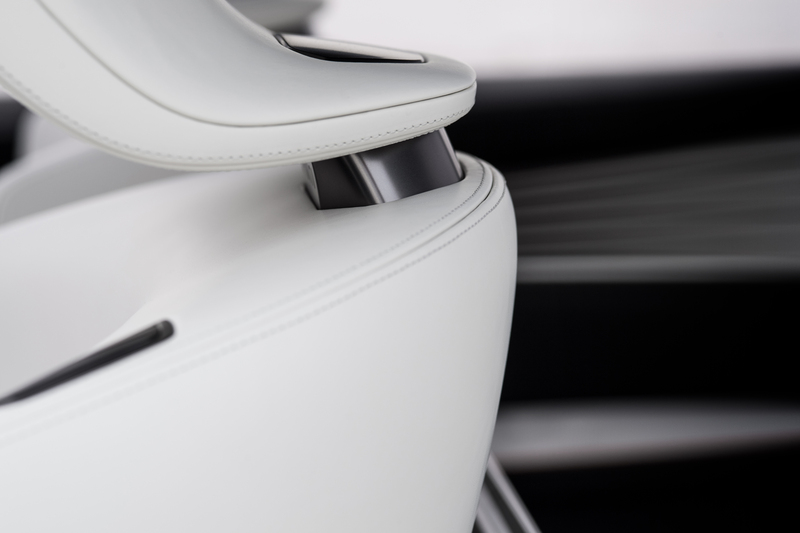 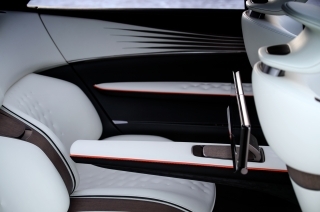 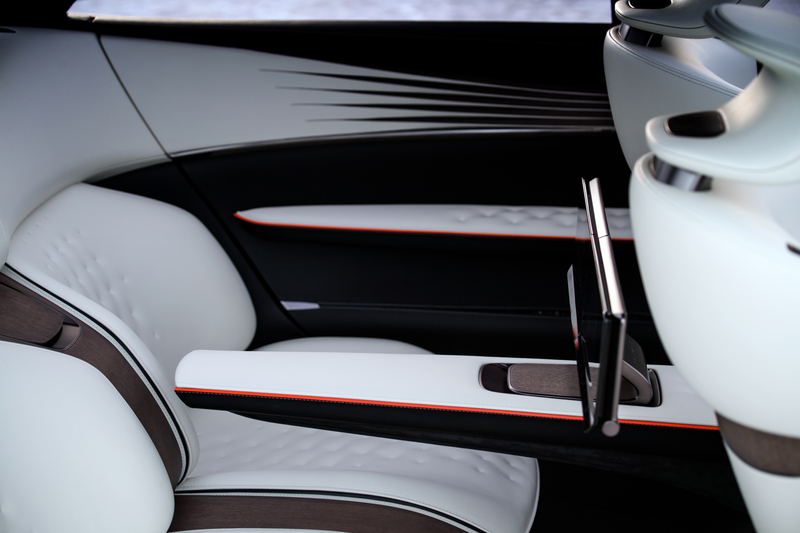 As the wood extends rearwards from the front of the cabin, along the top of the doors, it merges with slashed white leather. 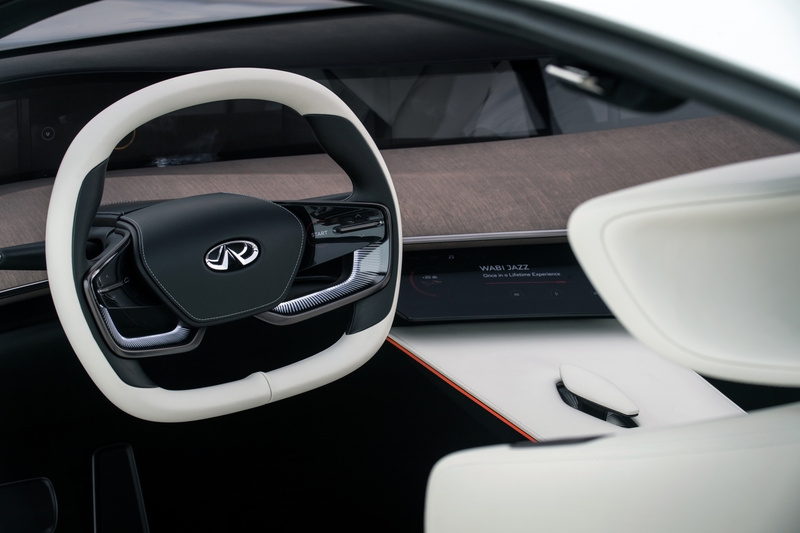 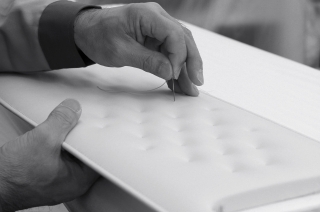 The seats, center console and doors are trimmed in soft white leather, finished with INFINITI’s own patented ‘dot-quilting’, for an informal, ‘unbuttoned’ twist on the traditional buttoned-down diamond patterns of a Chesterfield sofa. 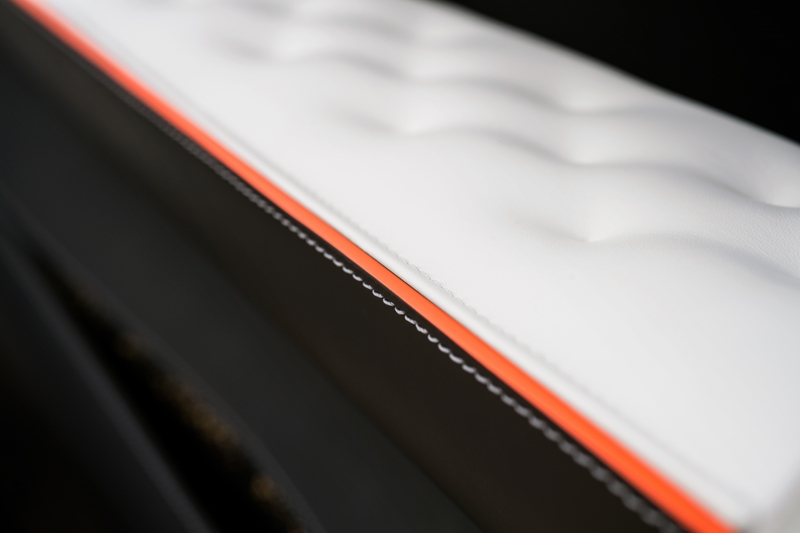 The white leather of the seats is lined with a flash of coral orange leather, matching the coral highlights of the aluminum alloy wheels. 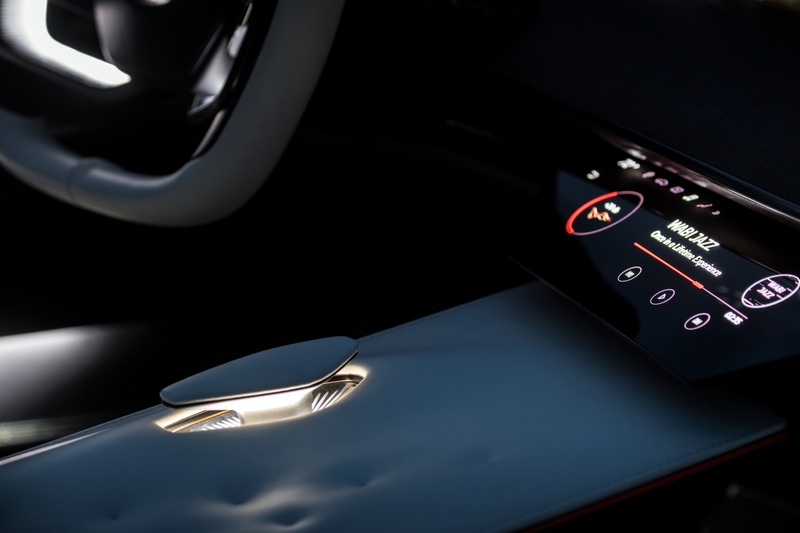 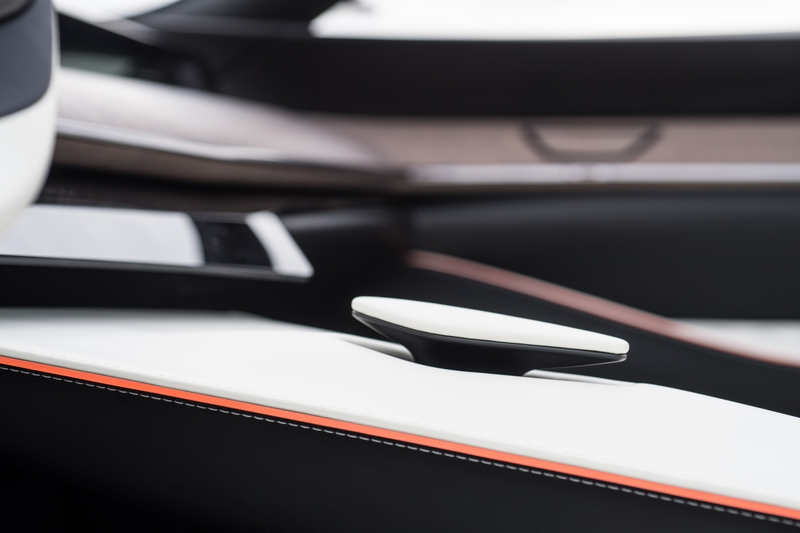 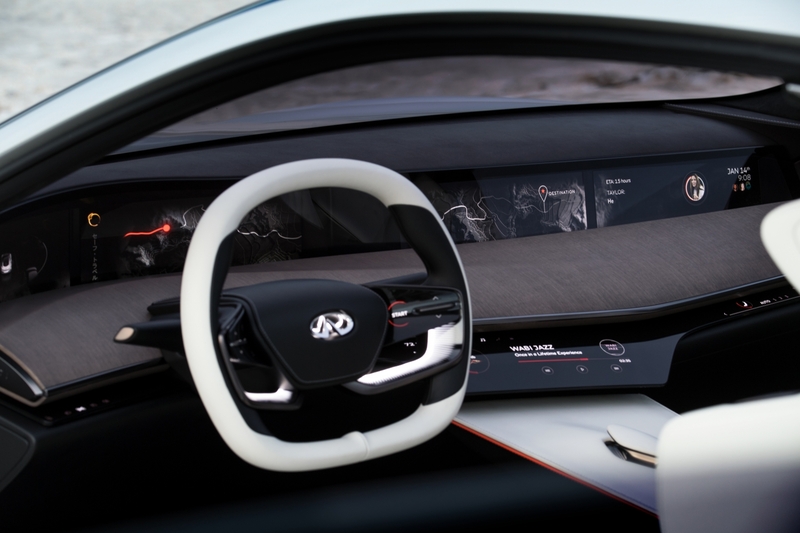 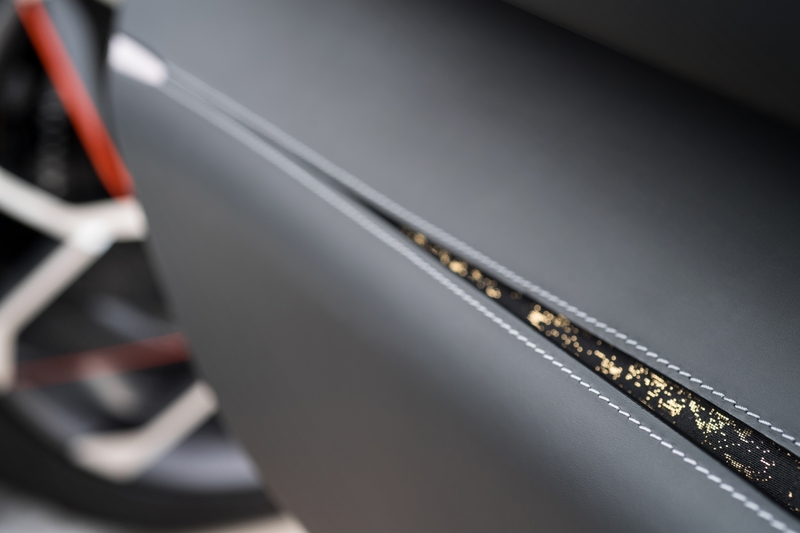 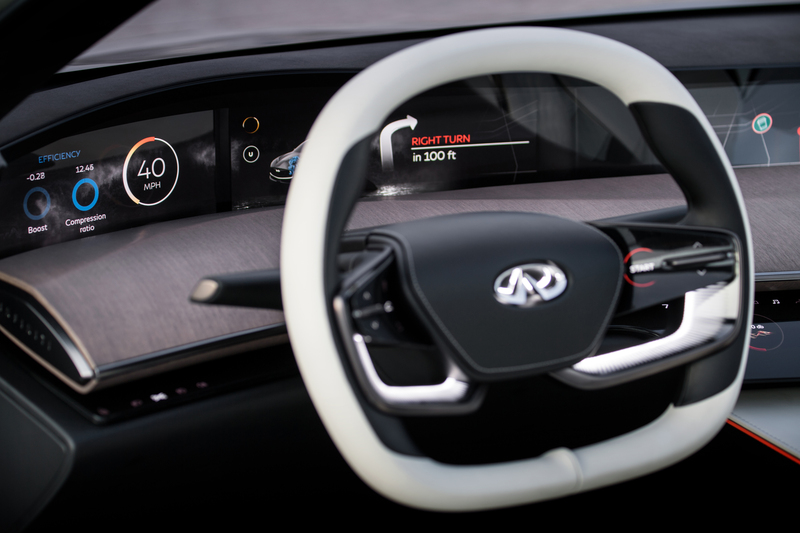 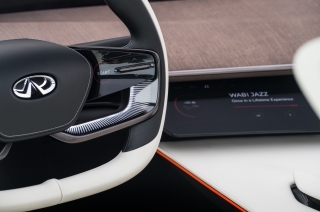 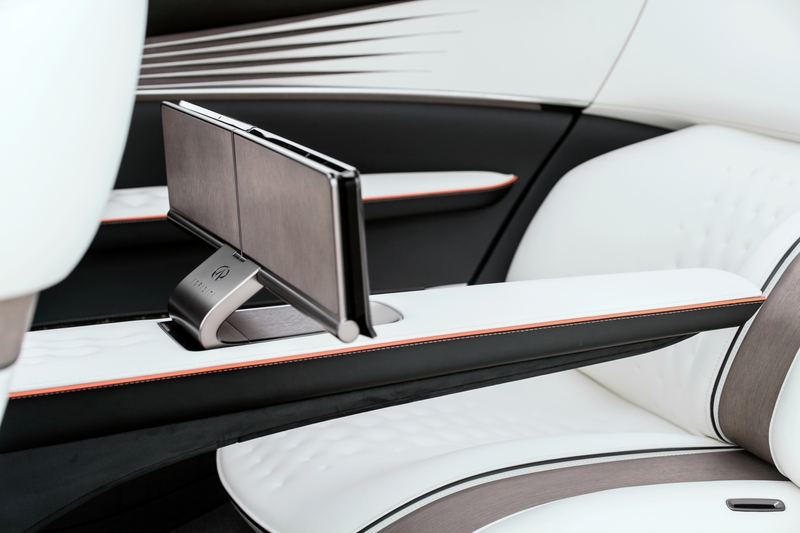 Black leather extends to the floor and over the far reaches of the digital dashboard. 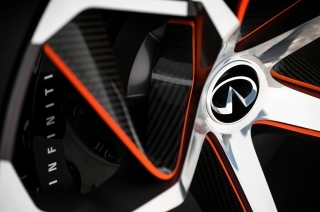 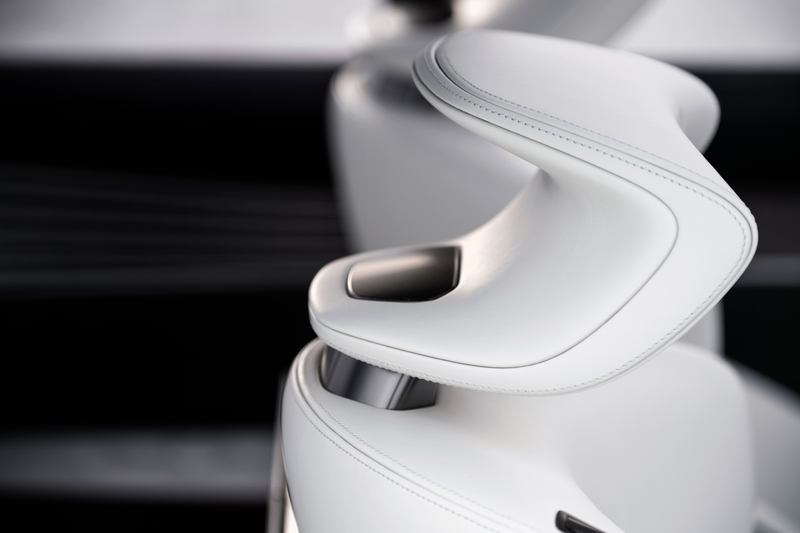 The Q Inspiration Concept is powered by INFINITI’s unique VC-Turbo technology, suggesting future application of variable compression ratio engines across a range of INFINITI models. 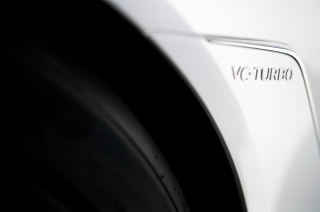 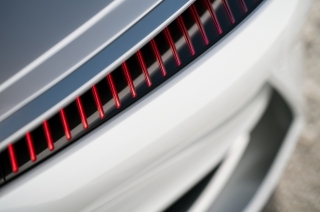 VC-Turbo represents a breakthrough in combustion engine design. 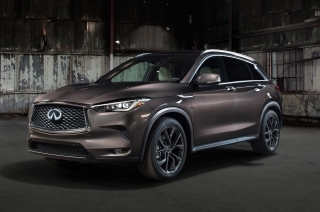 Following its production debut in the QX50, INFINITI’s VC-Turbo engine is the world’s first variable compression ratio engine. 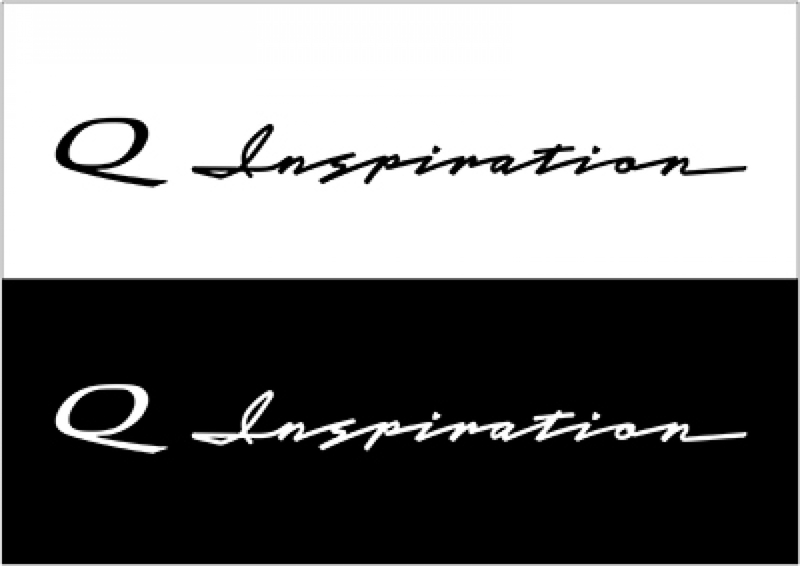 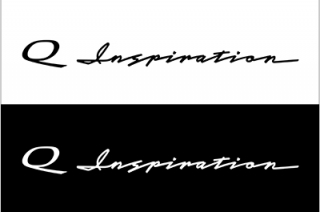 The Q Inspiration’s engine continually transforms, adjusting its compression ratio to optimize power and fuel efficiency. 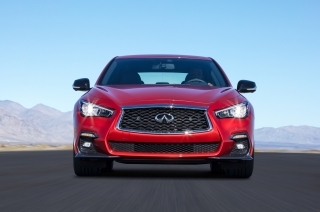 It combines the power of a larger V6 gasoline engine with the torque and efficiency of an advanced four-cylinder diesel engine. 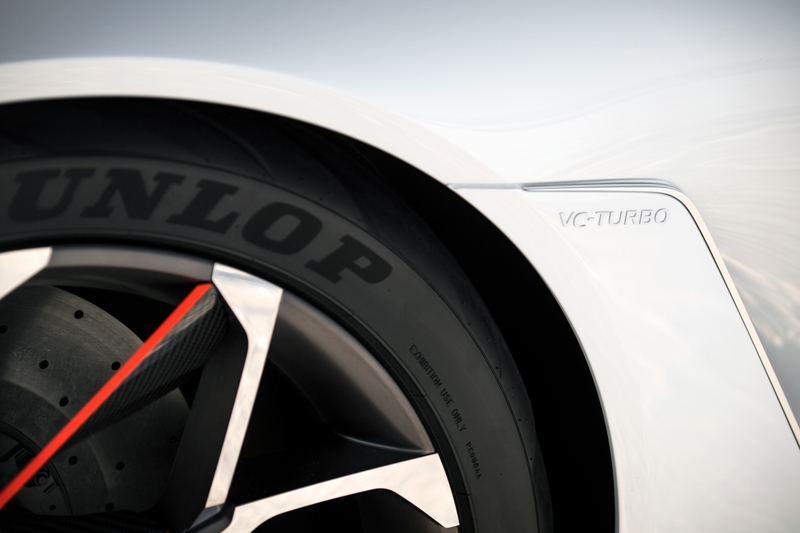 The VC-Turbo changes its compression ratio seamlessly with an advanced multi-link system, continuously raising or lowering the pistons’ reach to transform compression ratio – offering both power and efficiency, as the driver demands. 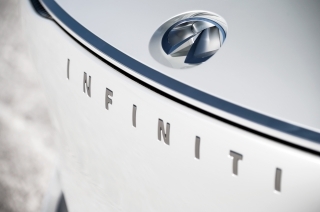 Deploying smart power for greater control, the empowering engine exemplifies INFINITI’s driver-centric approach. 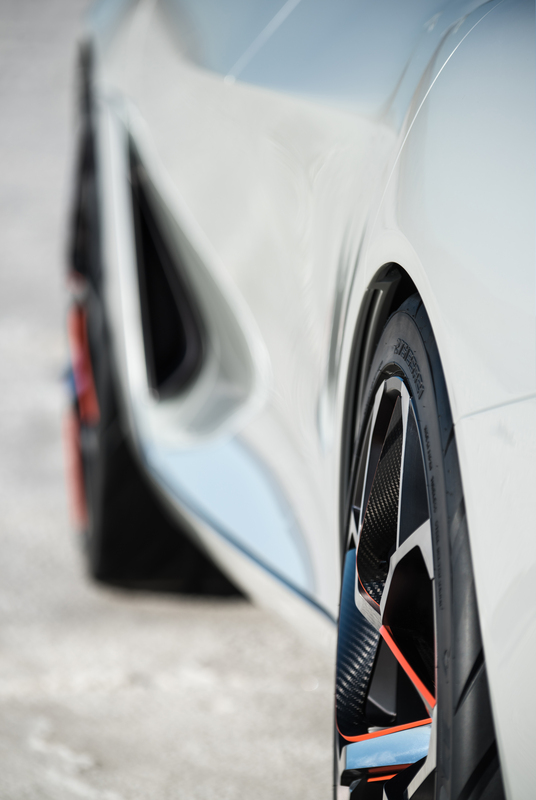 A high compression ratio gives greater efficiency while a low compression ratio allows for greater power and torque. The VC-Turbo engine offers any compression ratio between 8:1 (for high performance) and 14:1 (for high efficiency). 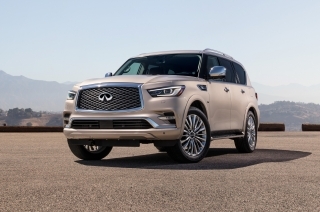 Its single-scroll turbocharger, mounted directly to the cylinder head integrated exhaust manifold, enables immediate throttle responses at any speed or compression ratio. 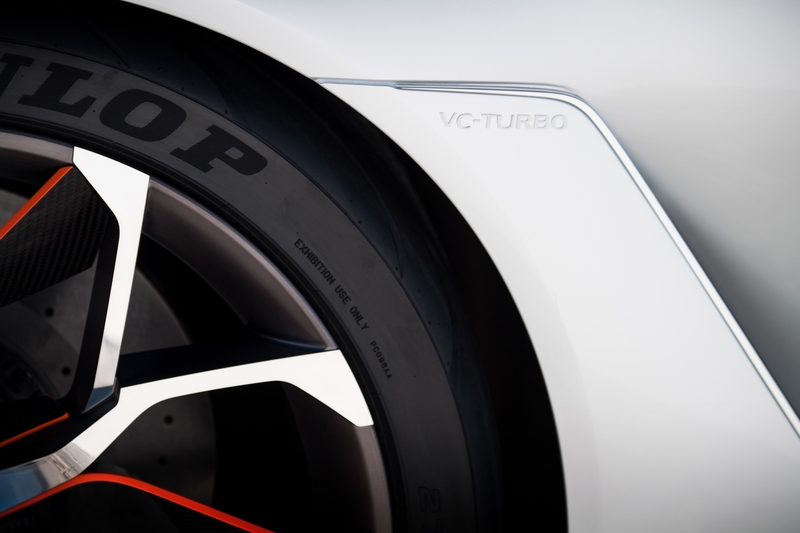 The VC-Turbo changes compression ratios seamlessly. The Q Inspiration represents INFINITI’s investigation to introduce its VC-Turbo engine technology to other models in future. Its compact packaging and flexible power delivery make VC-Turbo an ideal powertrain technology for propulsion across segments. 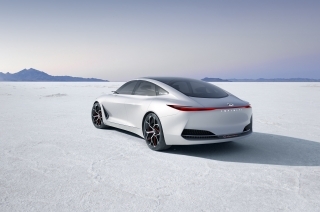 Powered by VC-Turbo, the Q Inspiration therefore volunteers a new approach to power delivery in the mid-size sedan segment, where many customers expect larger-displacement engines to provide adequate power and acceleration – often to the detriment of fuel efficiency. 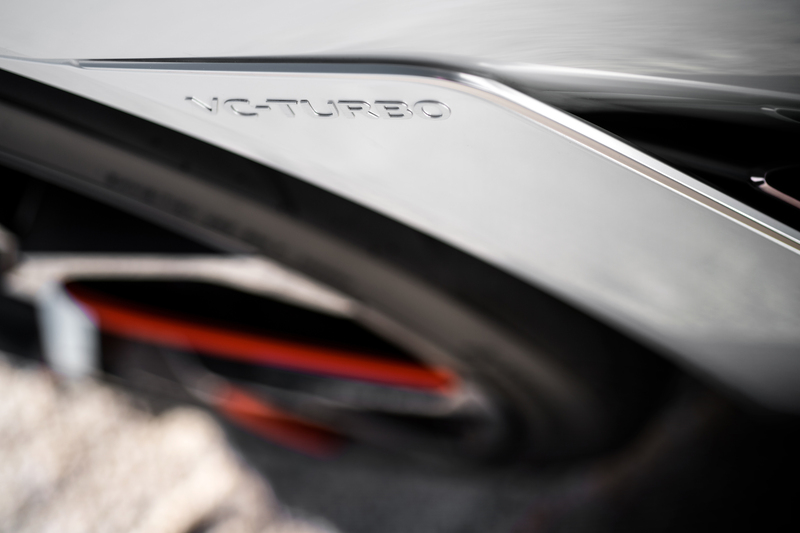 Though only a four-cylinder engine, the VC-Turbo’s blend of performance and efficiency challenges the notion that only hybrid and diesel powertrains can deliver high torque and efficiency. VC-Turbo technology also offers similar performance to some V6 gasoline engines, demonstrating the potential benefits to sedan buyers. 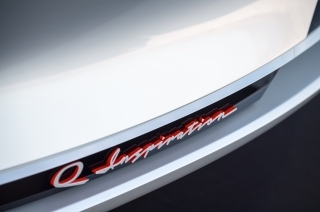 The Q Inspiration provides drivers with an intelligent all-wheel drive system, a front-biased drivetrain able to apportion torque to individual rear wheels as driving conditions demand. ProPILOT is the umbrella term under which all future INFINITI autonomous drive support technologies will be based. 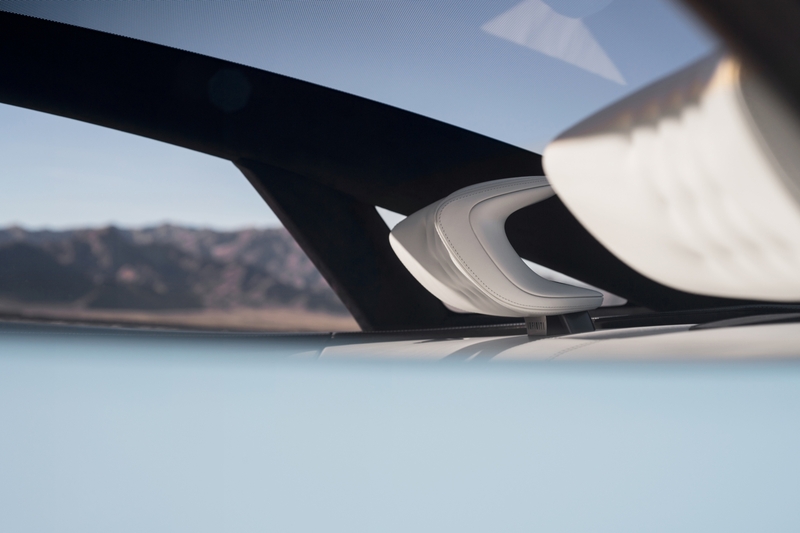 Drawing on inputs from radar and camera to read the road ahead and monitor the position of other vehicles, the system allows the driver and car to react accordingly. Central to INFINITI’s strategy for developing ProPILOT is a commitment to allow drivers to retain ultimate control over their vehicle, in keeping with INFINITI’s focus on driver engagement. The Q Inspiration’s ProPILOT autonomous drive technologies support drivers in identifying and responding to other road users and potential hazards. Acting as a ‘co-pilot’, these autonomous drive technologies enhance drivers’ capabilities and enable them to delegate more onerous driving tasks to the car. 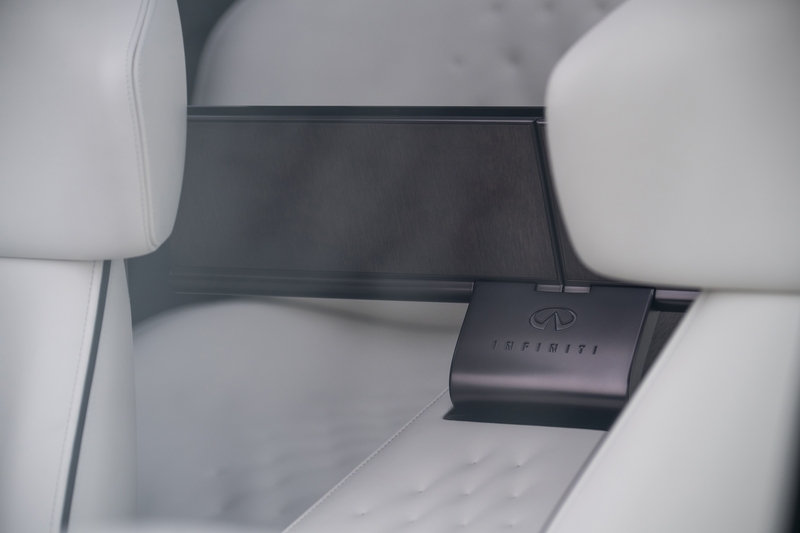 When the driver does not require the individual performance and engagement afforded to them by their INFINITI, ProPILOT frees them from mundane or stressful driving situations. 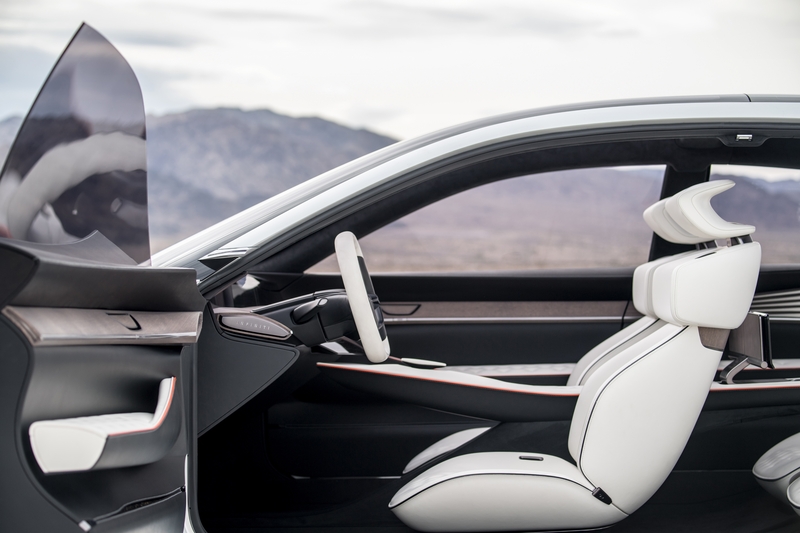 ProPILOT empowers drivers with ‘end-to-end’ autonomous driving, providing autonomous multi-lane highway driving and intersection auto-navigation functionalities. 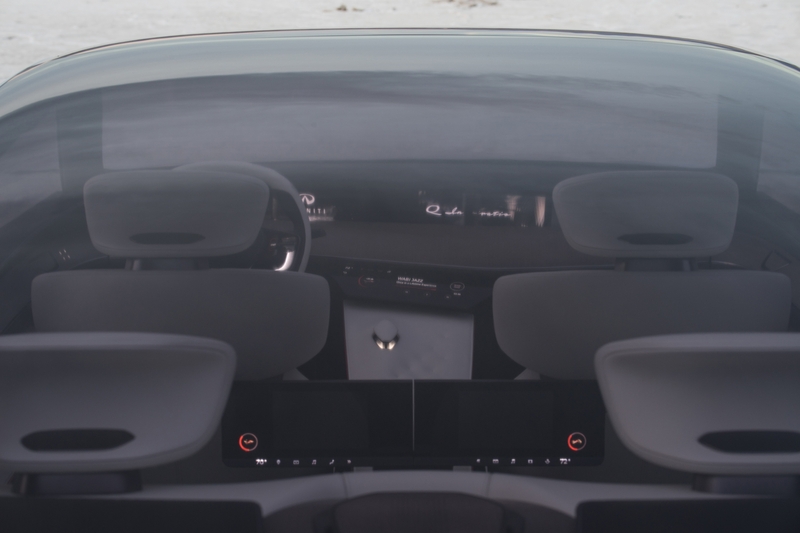 These near-future technologies work alongside existing ProPILOT Assist technologies, such as the capability to navigate stop-start highway traffic, and monitor the positions of surrounding vehicles. 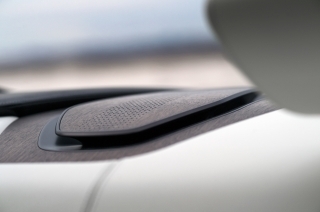 ProPILOT helps drivers complete their journeys more safely and more efficiently.